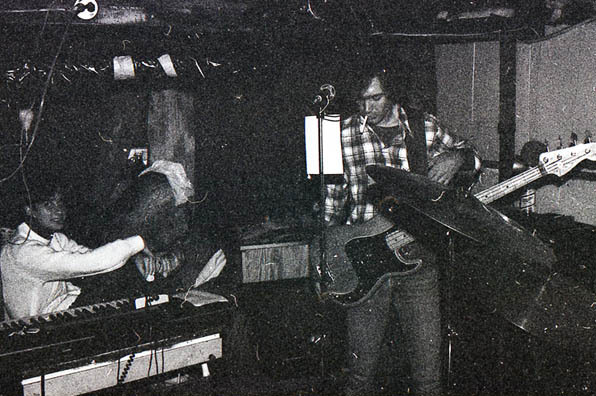 Above: The Fashion Jungle rehearses “Don’t Sell the Condo” in Steve‘s basement, early 1988. Videographer: Gretchen Schaefer. | Buy this soundtrack! They say that when a door closes, a window opens. I say that when a door closes, one should sit quietly with a magazine and wait for it to open again. But sometimes that never happens. 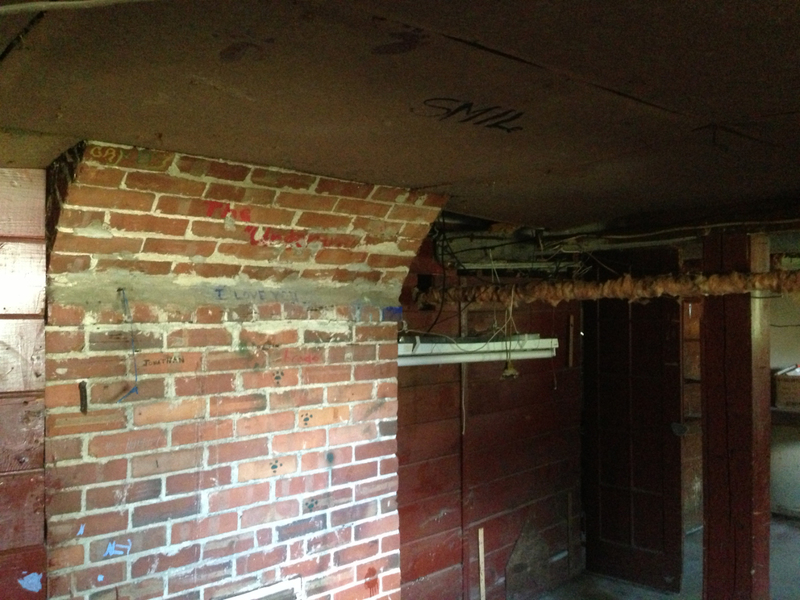 In the late ’80s, confronted with a closing door, I did actually find a window to crawl out through. 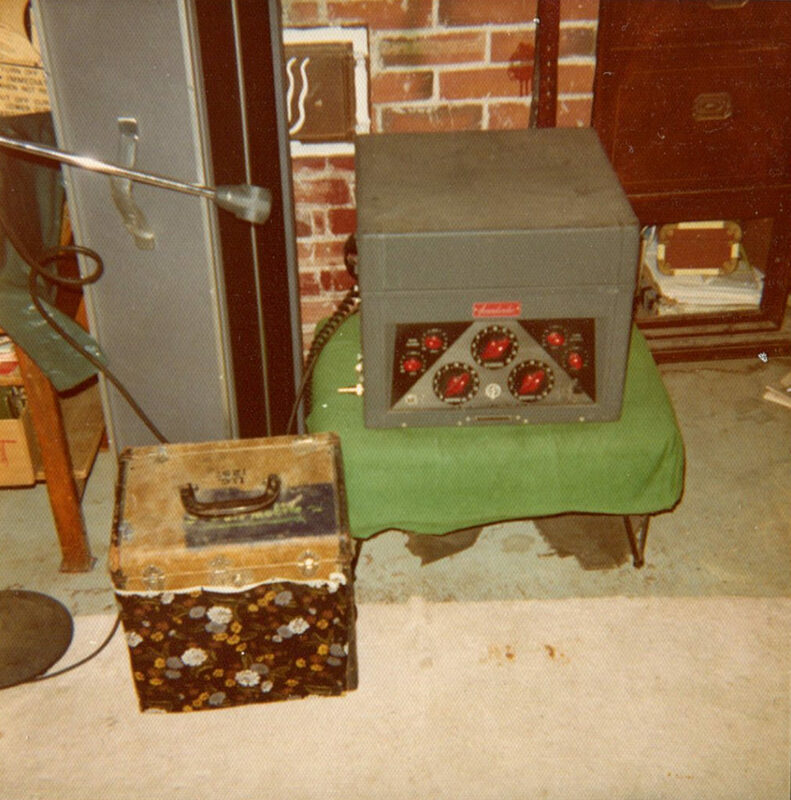 Gretchen Schaefer and I were trying to record a rootsy version, guitar and accordion, of “Good King Wenceslas” for a Christmas Greeting Tape in December 1987 when the recording device, a Sony TC-540 reel-to-reel tape recorder, became balky about tracking on one of its two channels. Soon thereafter it wouldn’t capture much sound at all. The problem was diagnosed, vaguely, as deteriorating electronic components. That meant that after nearly 20 years, I had suddenly lost a foundation of my identify. 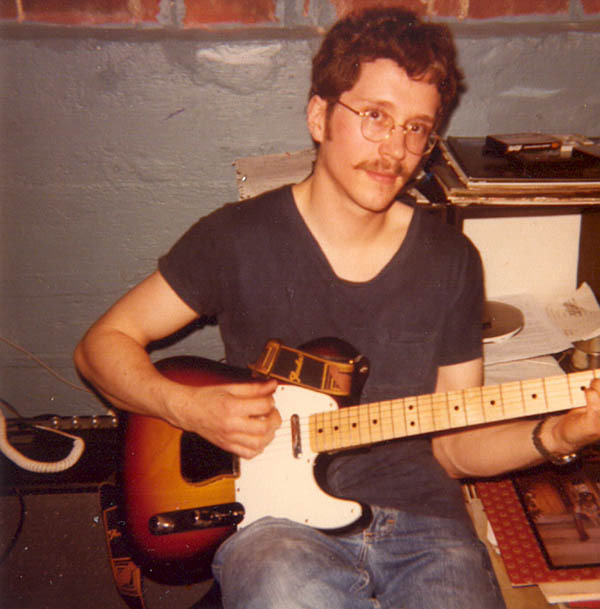 I had never recorded prolifically, but making music on tape was integral to my self-image. I think the loss was more emotional than functional: The Sony would still play tapes back, which preserved its role as my personal Wayback Machine. And I could make audio recordings with other equipment — a succession of cassette recorders that afforded neither the nice crisp sound of the Sony (which, if you have played many of the songs that accompany these blogs, you have likely experienced) nor its handy capability for overdubbing. Richard Julio introduces us at Video A Go-Go. I wasn’t devastated. 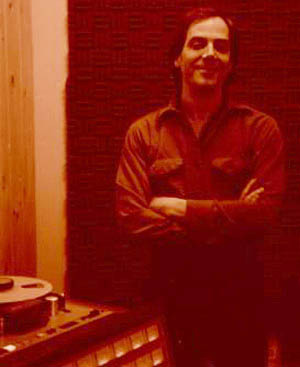 I knew that once I started making more money, I could simply buy a new reel-to-reel. I could have tried harder to get the Sony fixed. (And maybe I realized on some level that, in any case, digital technology was ultimately going to change the game completely). I just didn’t like this failure of the Sony’s. As someone with a lifelong silly habit of anthropomorphizing inanimate objects, I felt like a trusted friendship had turned bad. A boy and his tape recorder, 1982. Hubley Archives. I wasn’t devastated, but I was unsettled. I flailed for seven years. I made recordings on all kinds of unlikely machines, including a visibility-yellow Sony all-weather boombox and a tiny Walkman that I bought for work-related interviews. It was good training in adaptability, but the sound was never great. So that was the door. And what was the window? It was video. 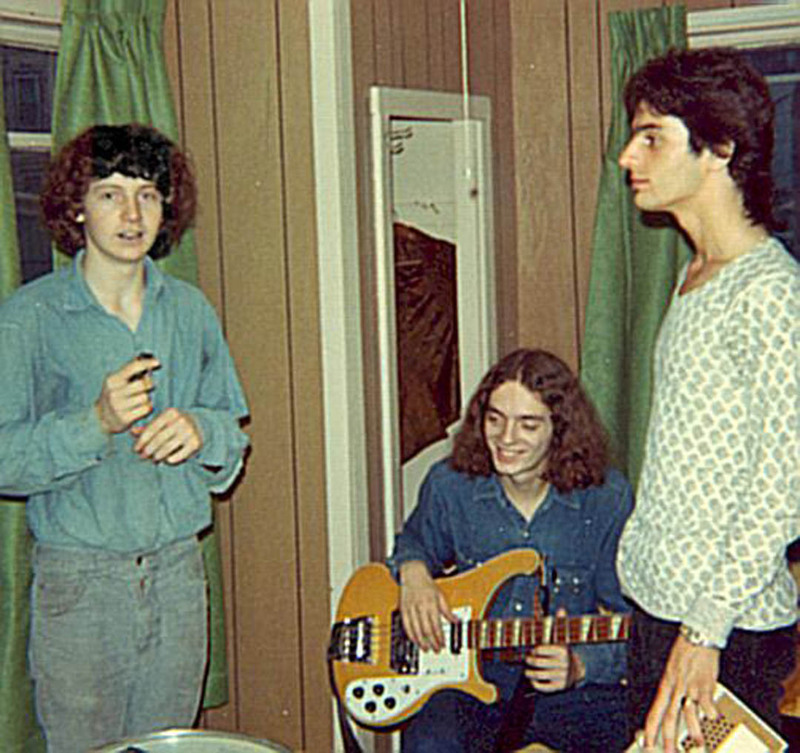 Even as I was thrashing around in search of an audio recording solution, my band, the Fashion Jungle, suddenly got a few opportunities for video recording — opportunities that resulted in the best documentary materials of the band’s last stages. 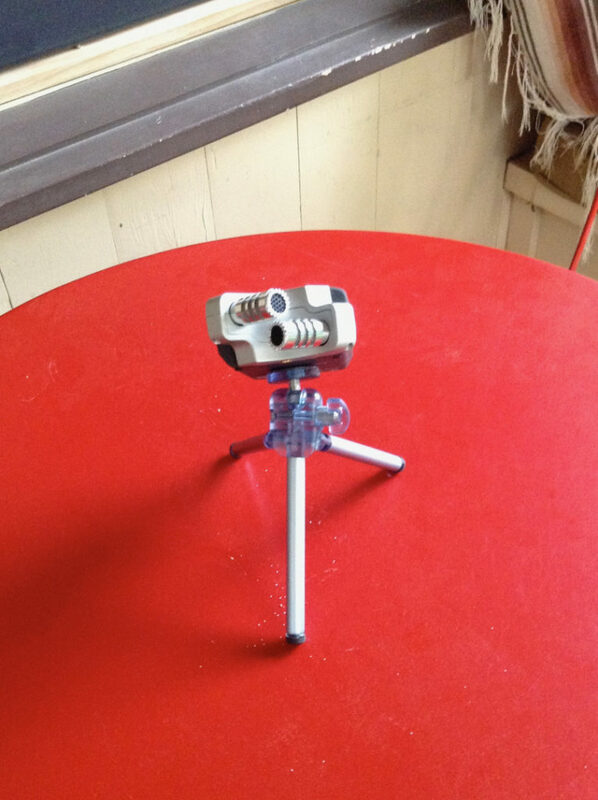 Our friend Alden Bodwell worked for a media company and was able to borrow video gear. 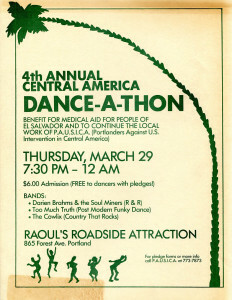 His generosity resulted in two concert videos, including a date at the Brunswick, a nightspot in Old Orchard Beach, Maine. 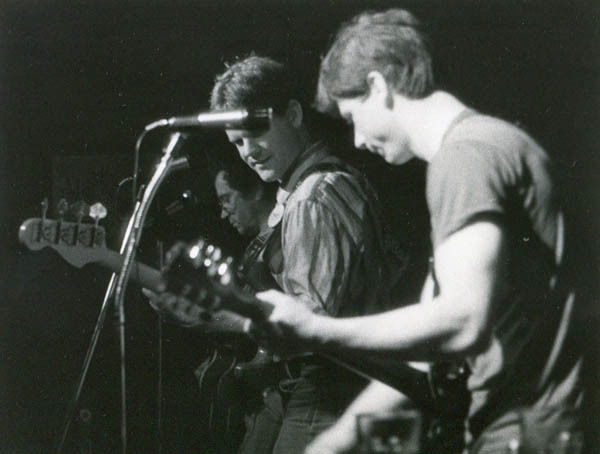 The video of “Little Cries” posted below is from that gig, which Alden shot on a foggy night in May 1988. Gretchen, then my partner and now my wife, in early 1988 borrowed a camcorder from the school where she was student-teaching. 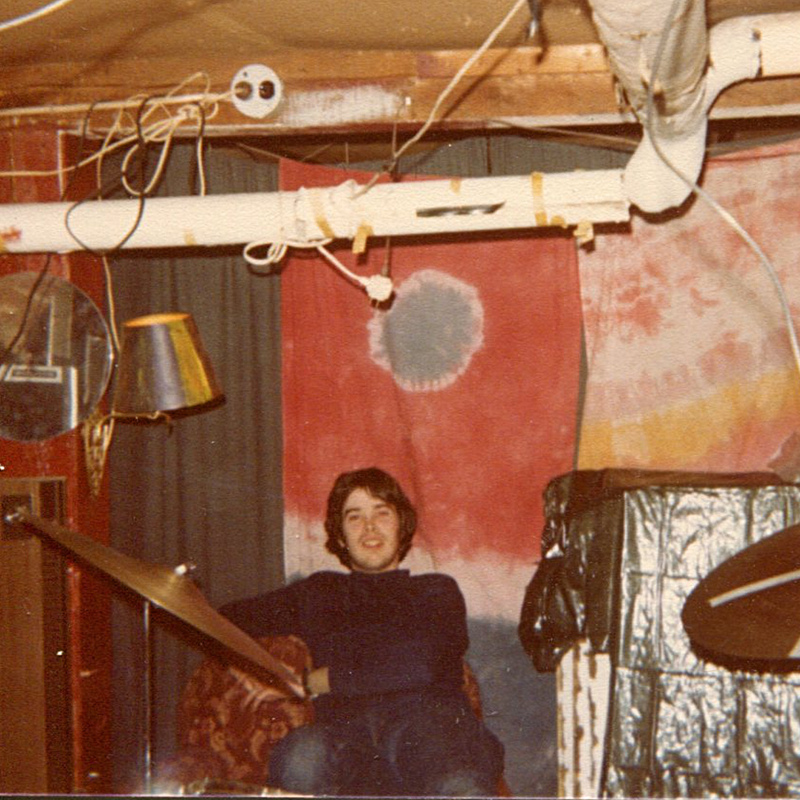 Back then we were rehearsing in a studio that bassist Steve Chapman had built in his basement. 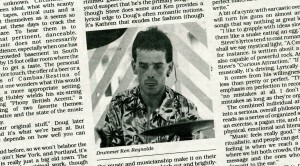 “(Drummer Ken Reynolds completed the ensemble.) 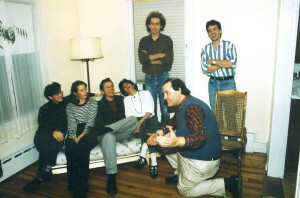 “Don’t Sell the Condo,” at the top of this post, represents Gretchen’s recording of a typical rehearsal. 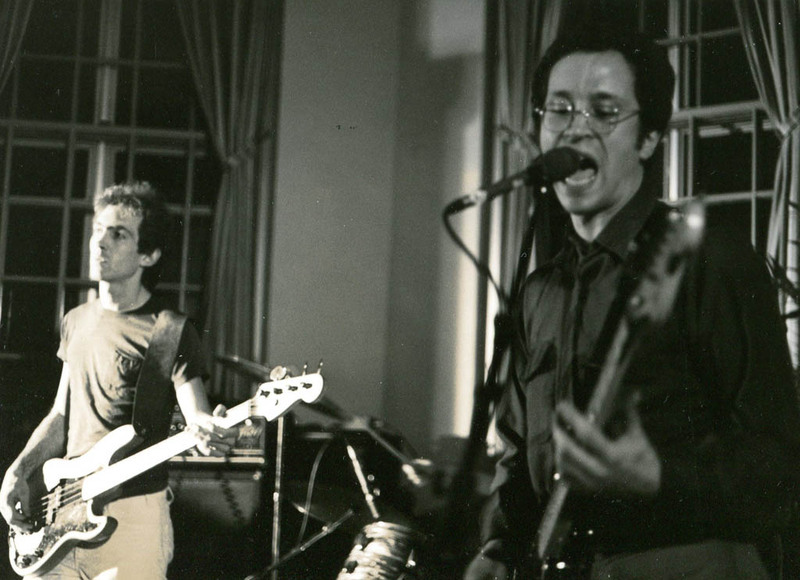 We enlisted two other bands for the concert that was cablecast live on May 21, 1988. The Brood, managed by rare-record dealer Richard Julio, was an all-female ensemble led by Chris Horne and dedicated to ’60s garage band sounds. 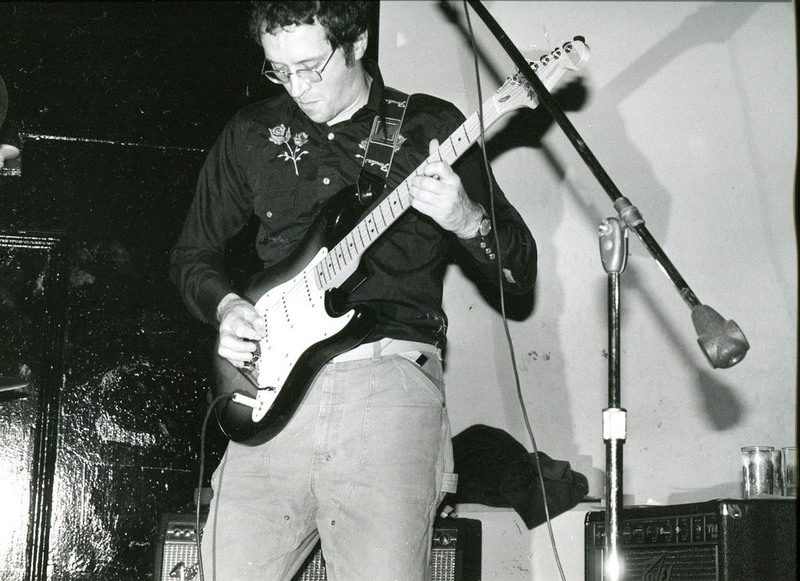 The Holy Bones were fronted by singer-songwriter Darien Brahms, who remains a force in the Portland music scene; and the late Manny Verzosa, remembered as a promising talent lost way too soon. It was a hot, humid and nervous-making night. The TV crew were all SPTV volunteers, including Alden. The show was cablecast from the SMTC cafeteria. There were audio problems, thanks in part to the distance from the cafeteria to the control booth, in a separate building. 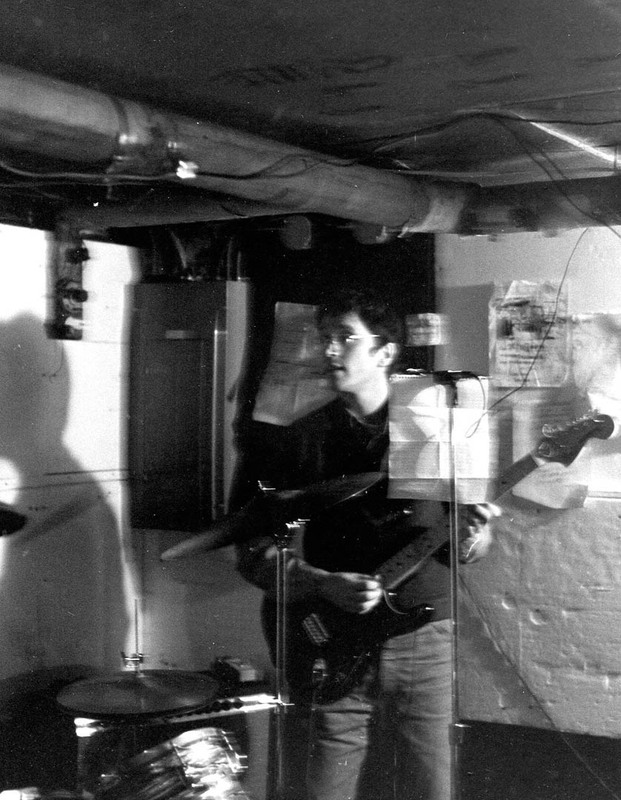 In fact, I don’t remember it actually being that much fun — I think the Brood and the Holy Bones left after their sets, taking their friends with them, and we played to an empty room. I don’t know how much, if any, fundage was generated for SPTV. I do recall some kind of fractiousness, though not who was involved nor what it was about. My nerves were scrambled. 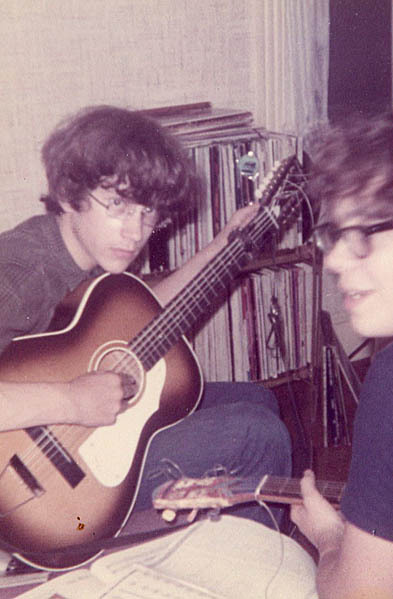 Ken and Steve were rock-solid, but my guitar playing was skittery as hell. For years I would not go near either the video or audio recordings of this event — too abrasive in my memory. 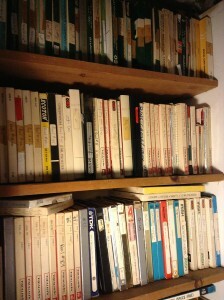 Today, of course, I’m delighted to have all these video documents. 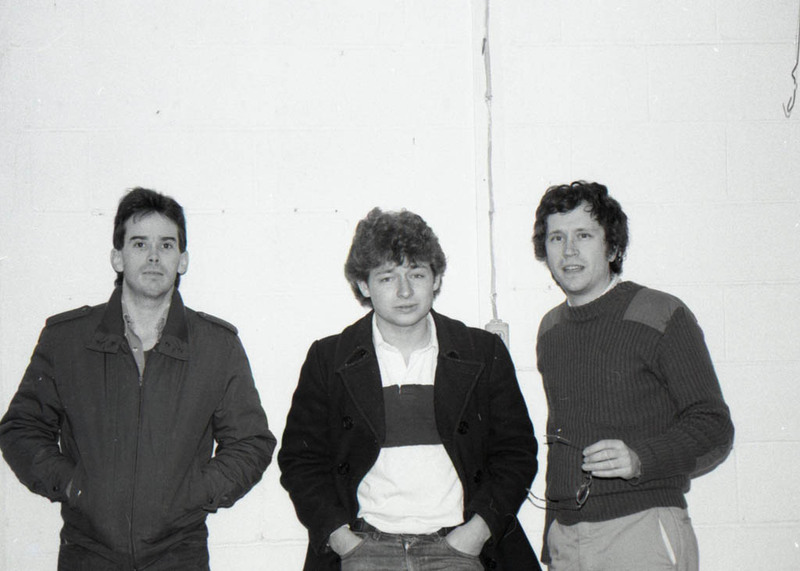 How young and energetic, and serious, we were (and how old I sound saying that). I’m all the more grateful for these videos when I think how precious and important video seemed back then — these were the years, after all, when MTV and VH-1 were showing music videos, and video was a must-do for musicians — and how inaccessible. I craved a camcorder for years in the 1980s, despite having no means of editing video. But I never felt I could afford one. Now, in effect, I have three video cameras, which together cost less than one camcorder would have gone for in 1988. Video is as easy as pushing a button. I shoot scenery from the train, the winter rye waving in the sun in our front yard, the evidence of a Pabst Blue Ribbon price war in Nederland, Colo. Between technology and experience and some money, so many things that once seemed impossible have drifted into reach. It’s one of the things that has impressed me the most about getting older. Then the question is: What do you do with those things once you have them? They say that when a door closes, a window opens. But they don’t say what happens when the walls go away. Famous music critic on local television wires, 1986! In March 1986, I interviewed Alana MacDonald of the trio Devonsquare for an article about the status and experiences of women in pop music. 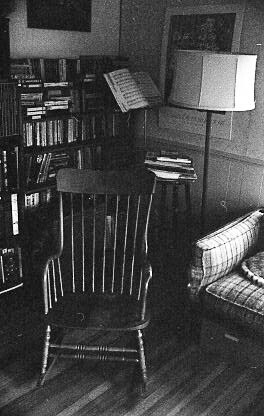 The living room at 506 Preble St., South Portland. 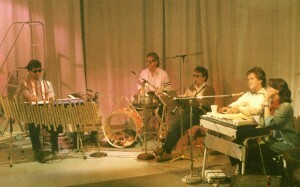 The music stand holds a Palmer-Hughes accordion instruction book. Digital scan from black & white negative/Hubley Archives. 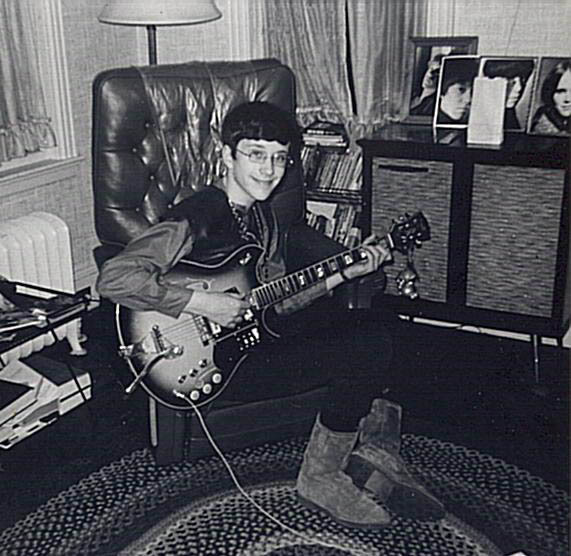 MacDonald, singer and violinist for one of the most popular club acts in the Northeast, was friendly and forthcoming. Toward the end of our meeting I felt encouraged to ask about perhaps submitting a few of my songs to Devonsquare. MacDonald kindly expressed openness to the idea (although it’s hard to imagine that folk-pop trio doing, say, “Little Cries”). But I never followed up. That article today doesn’t read like much (especially to a regular viewer of “Nashville”). But the interview, over coffee at the legendary Portland bistro Deli One, stands out as symbolic of that time in my life. 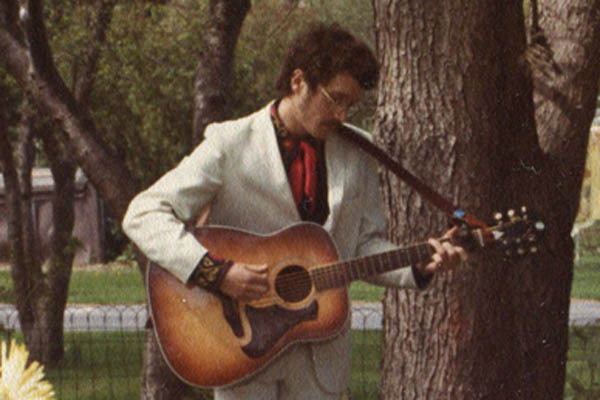 In recent years I’ve lost sight of how connected I was back then, how many acquaintances I had made as a writer and musician. The same was true for my then-partner, now my wife, Gretchen Schaefer. As manager of Congress Square Gallery, she encountered a steady stream of art makers and consumers*. 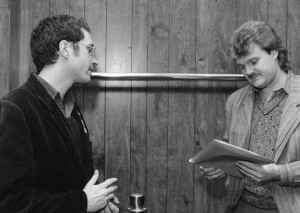 Backstage at the Cumberland County Civic Center in 1985, I give Ricky Scaggs copies of my Sunday Telegram article about him. 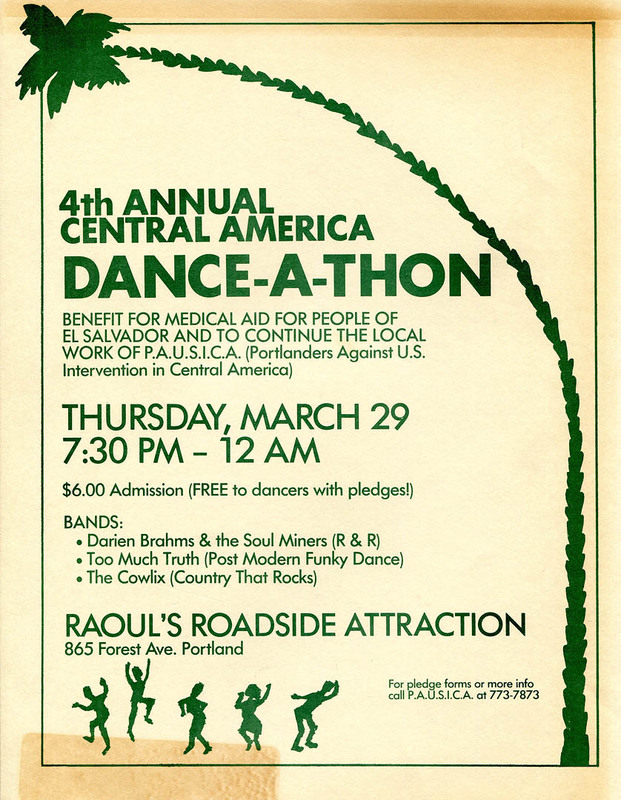 By no means are we recluses today, but the steady stream of encounters back then seemed part and parcel of our having “arrived” on the Portland scene. We weren’t in with the In Crowd, but we knew it to say “hi” to. 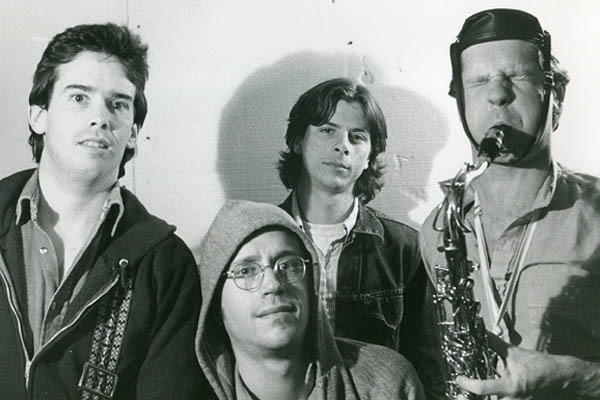 I talked to MacDonald for “Club Beat,” my music column for the Maine Sunday Telegram. 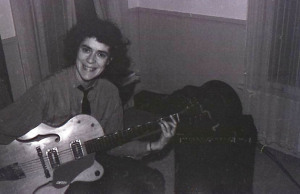 My other interviewees for that piece included Cathie Stebbins, a pop-blues singer big on the local circuit, and Chris Horne, a member of the all-female (“all-chick” to Chris) retro ’60s band The Brood — established players all. Gretchen’s studio at 506 Preble St., South Portland. Digital scan from black & white negative/Hubley Archives. In 1986 it was a shaky claim. 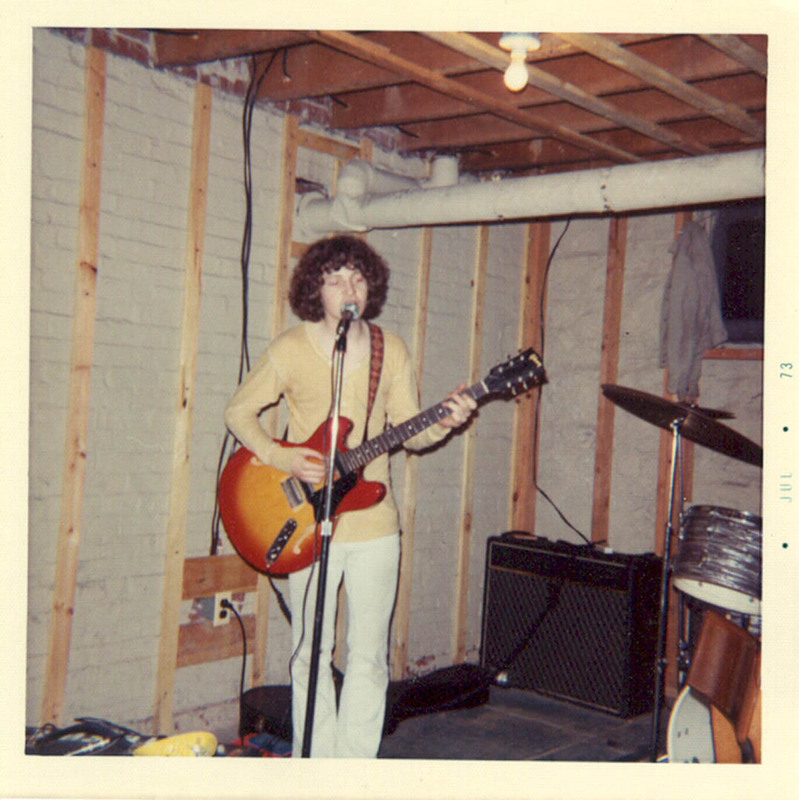 My band, the Fashion Jungle, had ground to a halt at the end of January, and for the rest of the year I barely touched a guitar, to say nothing about climbing up on a stage. 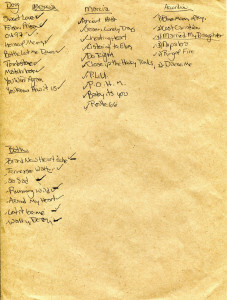 I wrote no songs. I have no recordings from 1986. This disconnect from what I profess to care so much about must have bothered me; but I don’t remember it. I suspect I was relieved to be done with the uncertainty of it all. I contemplated putting together a solo act, but couldn’t seem to get any traction. I like playing with other people. So, typically for me, instead getting back up on the Fashion Jungle horse and trying again, I lurched in a new direction. That fall I bought a cheap used 120-bass piano accordion and some Palmer-Hughes instruction books at Starbird Music. And it was love at first honk. 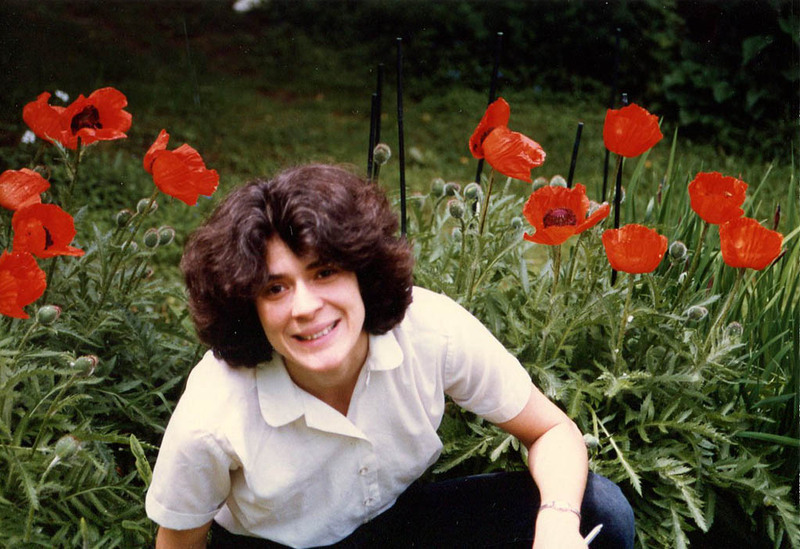 Gretchen in the garden at 506 Preble St. Hubley Archives. While I was playing little music, and none presentable (Palmer-Hughes’ “Vegetables on Parade,” anyone? ), I was hearing a ton of it, thanks to writing assignments from the Guy Gannett newspapers in Portland, Maine. Those included rock and pop record reviews; concert previews and reviews; and features about topics musical and otherwise. 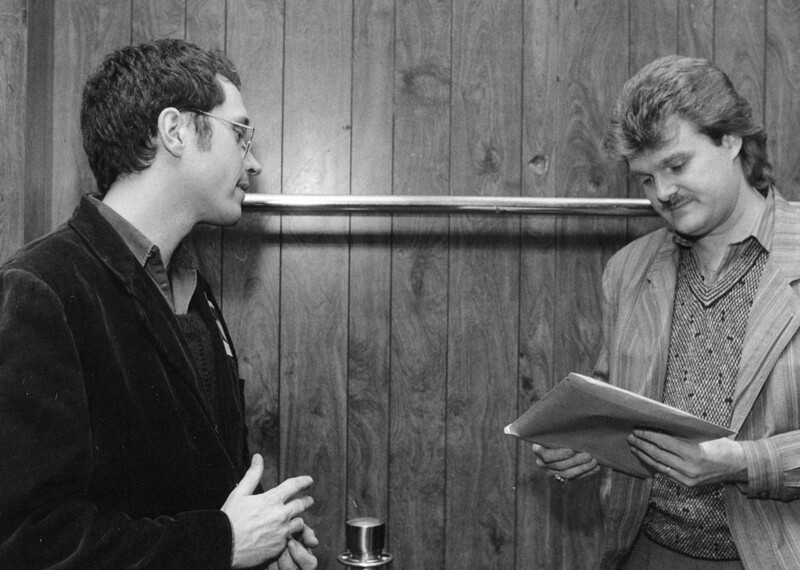 In 1986, in addition to 18 “Club Beat” columns, I did countless Portland Symphony Orchestra and other classical reviews, and covered in depth the sweepstakes for the selection of the PSO’s new conductor. I also reviewed pop and rock, live and on disc. 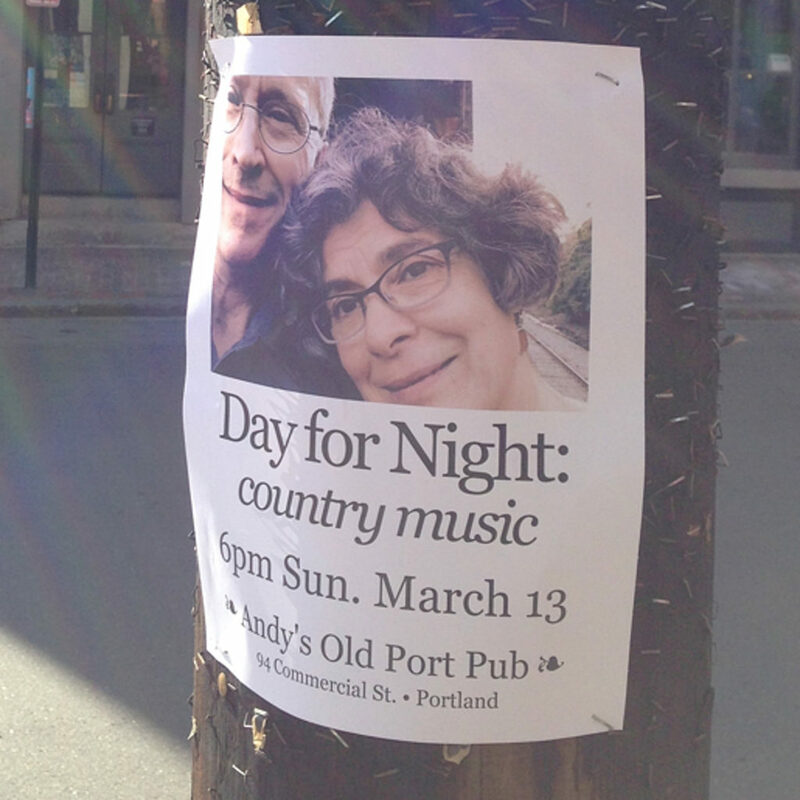 I advanced the Maine Festival and New Year’s / Portland — remember them? I wrote food stories, art reviews, a Christmas-shopping guide to new books about rock and pop music, and a feature about the stage costumes worn by classical and heavy metal musicians. Doug with “Addicted to Show Biz” star Omar Ricardo, aka Frank Omar. Randy Visser photo/SPTV. I talked with Harry Belafonte, Maria Muldaur, George Shearing, the Kronos Quartet, Sharon Isbin and Christopher Parkening, Simple Minds’ lead singer Jim Kerr, magician David Copperfield and a variety of Maine visual artists. My Smith-Corona typewriter got a workout. At the same time, I was catching shifts on the copy desk at the Portland Press Herald and the Evening Express. PH shifts ran from mid-afternoon till midnight or later, and Express shifts from 5 or 6 a.m. till early afternoon. A few times I’d show up for an Express shift a few hours after finishing a review or copy-desk stint for the Press Herald. 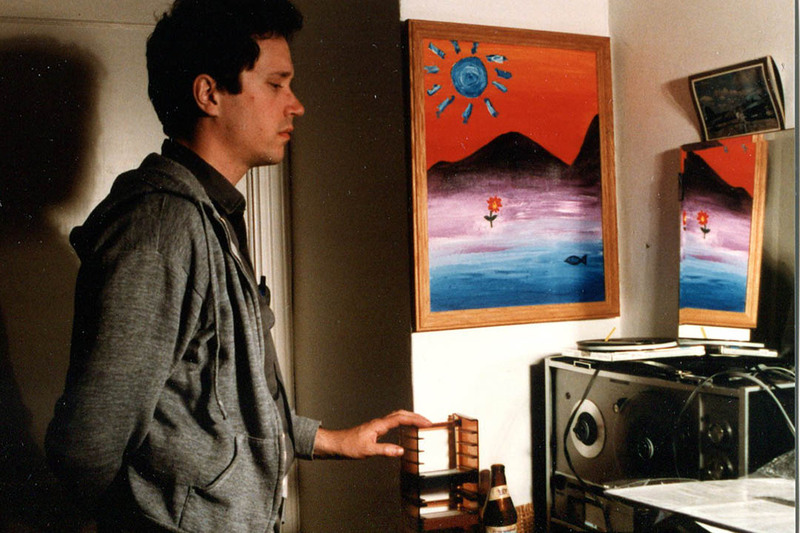 In short, the “creative renaissance” of 1985, with its metaphorical overtones of sweet dawn and blooming posies, had matured into a blurry high-pressure reality of late nights, early mornings, weekend work, writing and editing and gadding about. It was a hard slog, deficient in down time, but deeply educational. 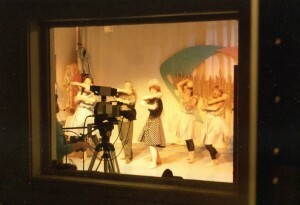 The Swedish Ball Team, seen through the control room window during the cablecast of “Addicted to Show Biz.” Randy Visser photo/SPTV. 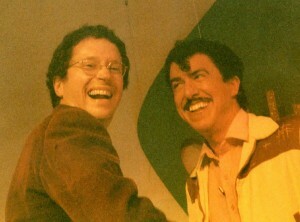 1986 was also a year for domestic synergy. 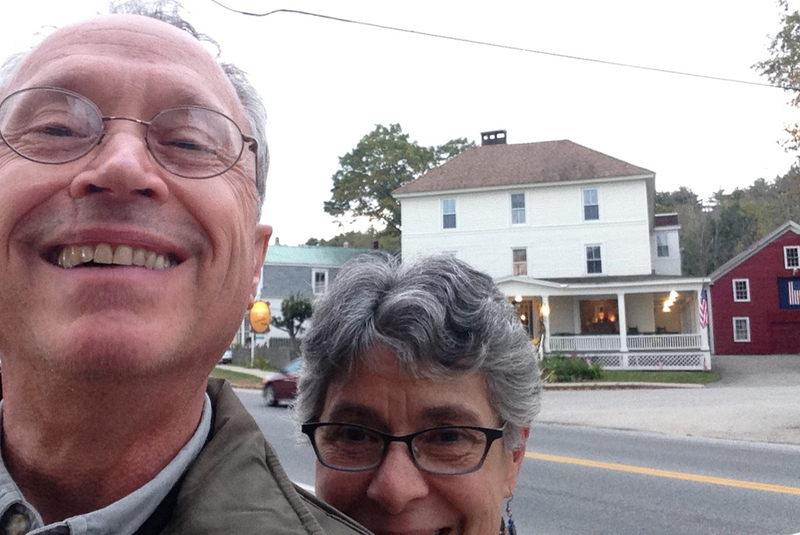 After five years together, Gretchen and I moved in together in March, renting a charming duplex in a charming neighborhood, near South Portland’s Willard Beach, amidst not so charming neighbors. 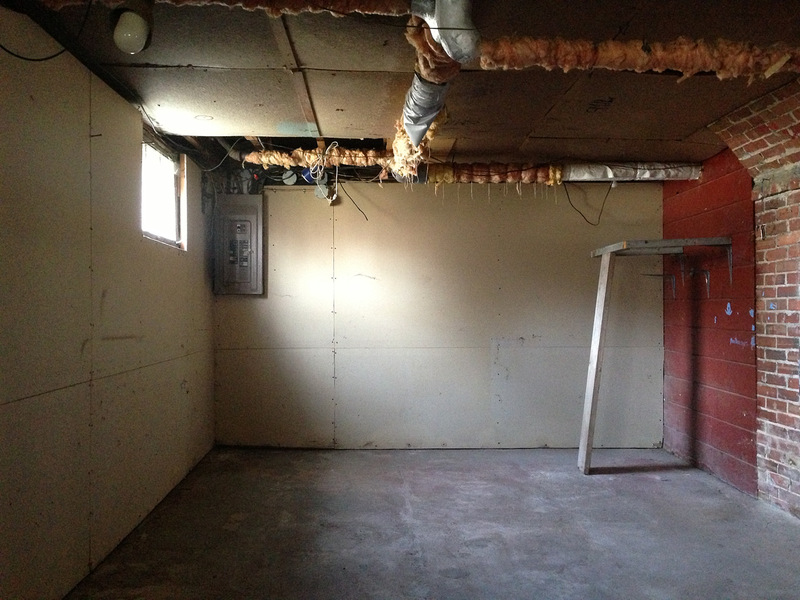 For the first time, I had an actual office, in a spare bedroom, and Gretchen had a large sunporch for her studio. The reality of hard work did not dampen our creative-renaissance ideal, and living together gave it new energy. We did carve out spare time, and immediately found ways to fill it up. Among them was the local public-access TV station, headquartered at Southern Maine Vocational-Technical Institute, just down the beach from us. We took a couple of TV production courses and began a relationship with South Portland TV director Randy Visser that would last a couple of years, and result in some actual programming. Gretchen and I each produced and directed a program for SPTV as our final projects for a course. Gretchen’s was “Art Who,” a look at the commercial art world that reflected her connections through the gallery. Her guests were Roger Richmond, who designed the Vietnam Veterans Memorial in Augusta, Maine; Elena Kubler, her colleague at the gallery; and Ellen Schiferl, a professor of art history with whom we had studied at the University of Southern Maine. “Addicted to Show Biz”: Charlie Brown, Mike Wiskey, Sean Potter, Will Jackson, Carla Bryson. Randy Visser photo/SPTV. Meanwhile, I had gotten to know the people of Delux Productions, a Maine musical cabaret troupe that made funny, sharply post-modernist takeoffs on showbiz tropes from the second half of the 20th century. 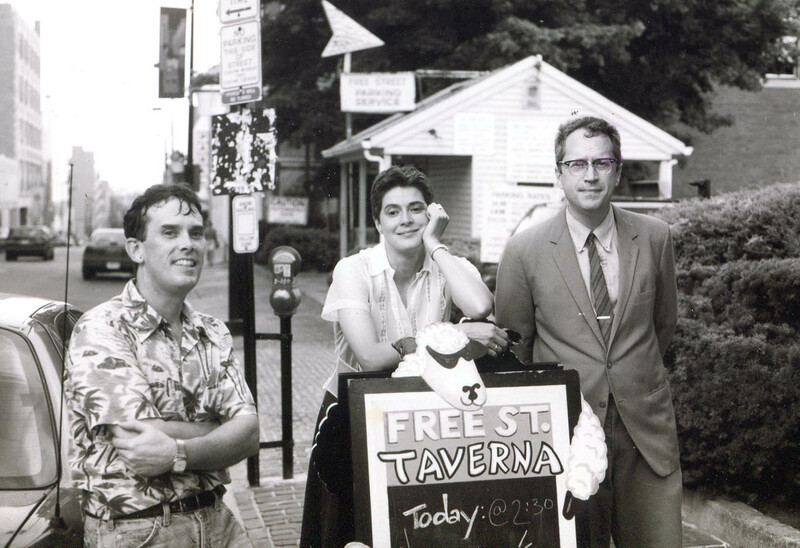 “We’re no less accessible than ‘I Love Lucy,’ ” Maria “Delux” Locke, one of the troupe’s leaders, told me for a “Club Beat” story about “A Big Big Show With a Big Big Band,” their 1986 summer cabaret series in Old Orchard Beach. 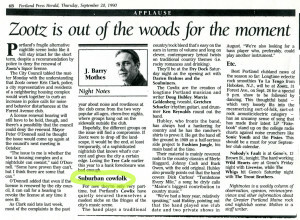 I approached Delux about appearing on SPTV, and the result was “Addicted to Show Biz.” A half-hour live cablecast, it was a variety show showcasing the best of Delux: host Omar Ricardo (real name: Frank Omar), a Ricky Ricardo wannabe; the acrobatic dancers of the Swedish Ball Team; the suave pop stylings of Will Jackson and Carla Bryson, sitting at the Fashion Jungle’s old Farfisa rock organ; Latin dance numbers; garish / vintage costumes created by Theresa Visinaire (who lent me a songbook of Polish songs for the accordion); Hartman singing Robert Palmer’s “Addicted to Love”; and the jazzy pop of a small combo led by keyboardist extraordinaire Charlie Brown. “Addicted to Show Biz” goes live. 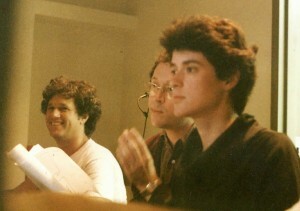 Director / producer Doug Hubley, center, with technical director Gretchen Schaefer, right, and audio engineer Neal Portnoy. Randy Visser photo/SPTV. That was some intense evening. 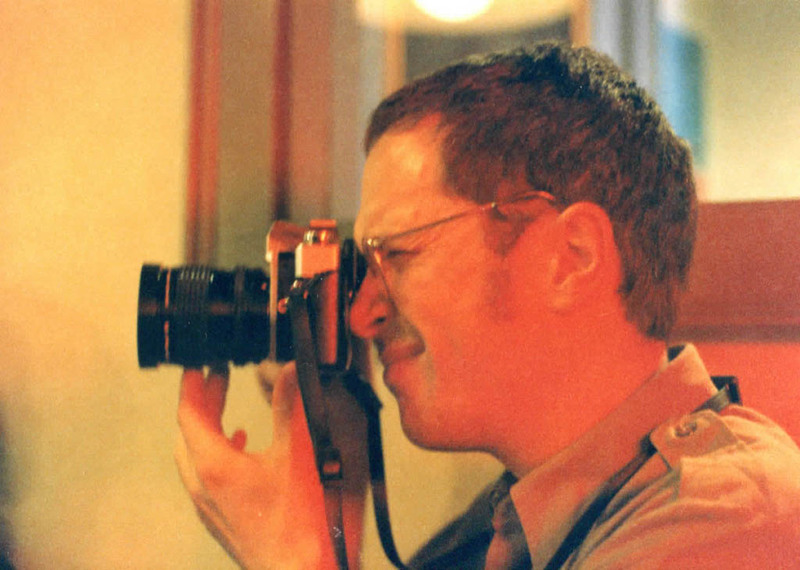 It was the first and only time I directed a TV show, and the tensions ran high and the camera angles askew. But it came off, distributed over SPTV’s cable feed to — what? 20, 30 people? Didn’t matter. I was ecstatic. I never heard how Delux really felt about it, but we stayed in touch, so they couldn’t have been too put off. Meanwhile, the wheel of fortune continued to turn. “Addicted to Show Biz” aired on Sept. 16. Just a week or so prior, former Fashion Jungle bassist Steve Chapman and Jeri Kane, whom he’d met in Boston, were married on a beautiful weekend day at Steve’s family cabin on Conway Lake, in New Hampshire. Gretchen, Kathren, Ken and I were among the guests. Soon the Chapmans moved to Portland. And soon after that, the Fashion Jungle was back. *In fact, at one point it dawned on us that one artsy couple was buddying up to us pretty much because of what we could do for them professionally. Our get-togethers with this pair, one of whom was a chilly landscapist with some name recognition, were marked by differences in outlook that belied any basis for real friendship. Naifs that we were, we got wise only when our jobs changed and we were no longer of use to them. 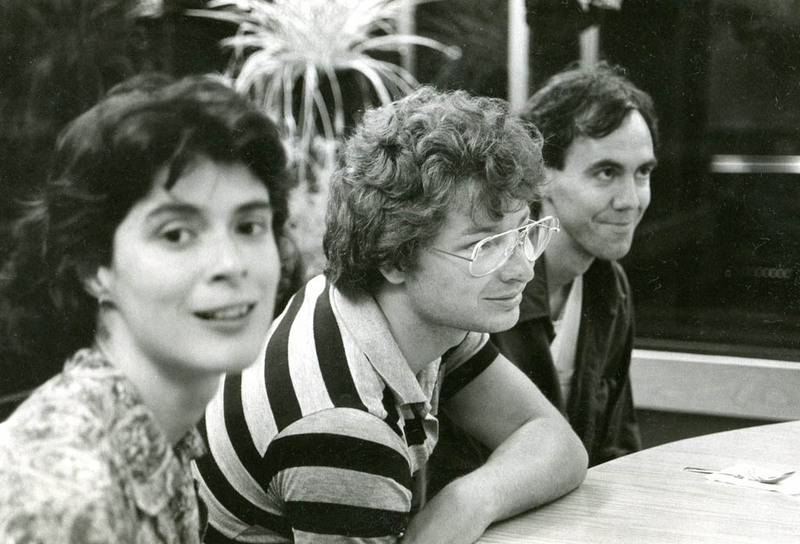 Gretchen Schaefer, Dan Knight and Jeff Stanton at Frosty’s doughnut shop, Brunswick, August 1985. 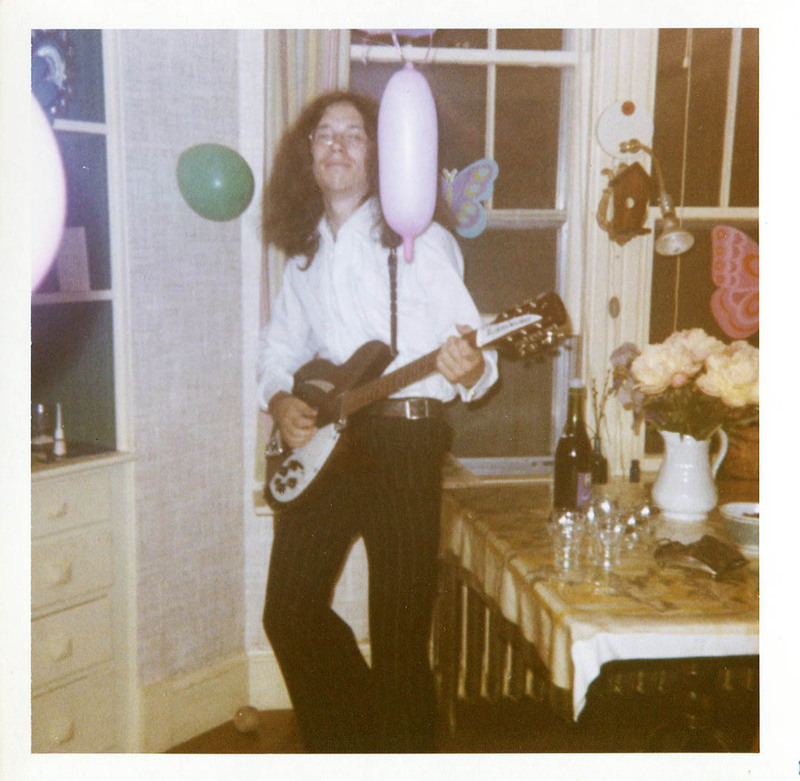 We were in town to see a Maine Festival concert by Richard Thompson, who was wearing a pink suit that clashed quite splendidly with his red hair. Having interviewed him a few weeks earlier, I felt entitled to corner Thompson backstage and force a Fashion Jungle tape on him. Hubley Archives. Skip prolix verbiage! Go straight to Body Shop and swinging Fashion Jungle tunes! Imagine a bloody hot attic apartment on a sunny afternoon, people crammed in under the dormers, champagne punch garnished with edible flowers frozen in ice (oh la), the mood garnished with kudos. 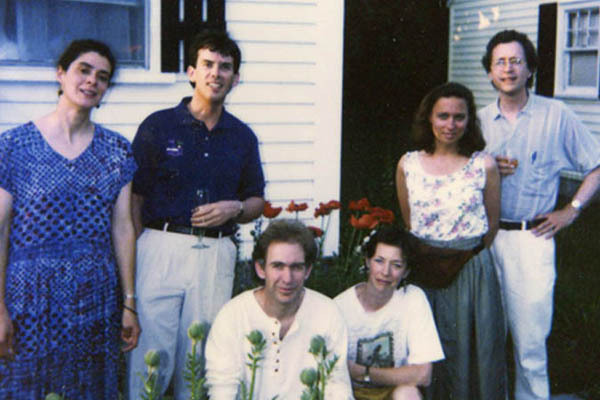 It was a party marking the beginning of my (first) career as a freelance writer and editor. 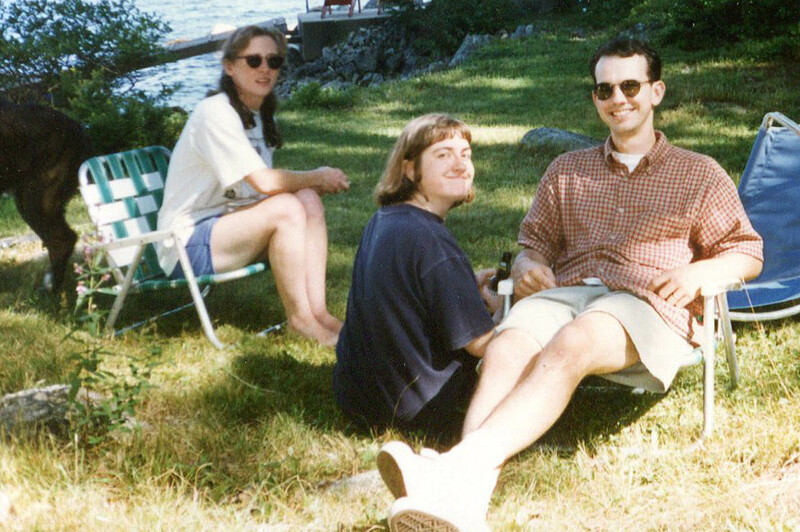 My girlfriend, Gretchen Schaefer, now my wife, graciously hosted the event in her tiny apartment near Willard Beach in South Portland, Maine. As Ray Davies sang, all of my friends were there. It was June 1, 1985. What a blast. Much of it is a blur but I have a vivid memory of Gretchen, me and Jeff Stanton, our good friend then and now, standing at water’s edge at Willard after the others had left, swaying happily in an alcoholic breeze as the waves caressed the sand and the sun sank low. That moment seems to symbolize that time in life for Gretchen and me. There are several half-baked concepts that my mind can’t shake off, and one of them is the “creative renaissance”: a rare and miraculous flowering of creative energy. 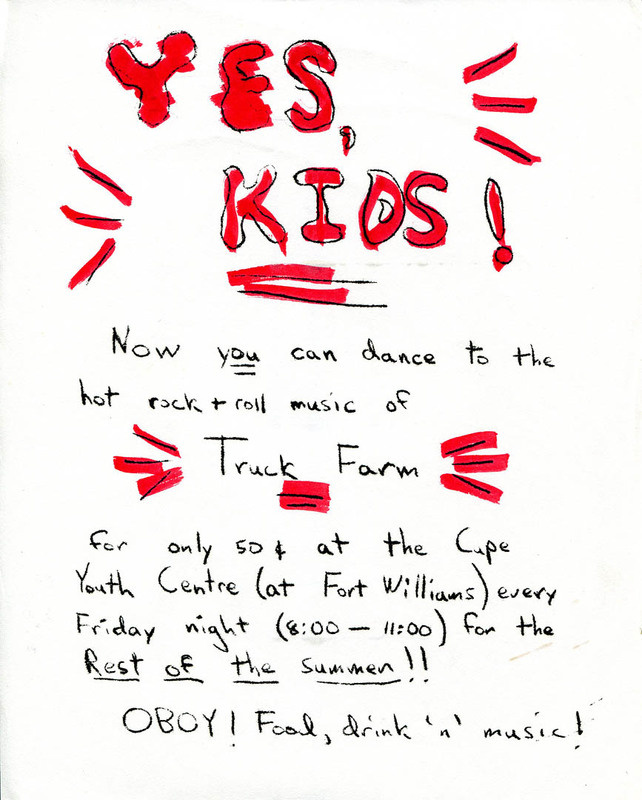 The mid- to late 1980s was such a time for us. After four years together, for us 1985 was the year when our interests and ambitions seemed to begin to bear fruit. 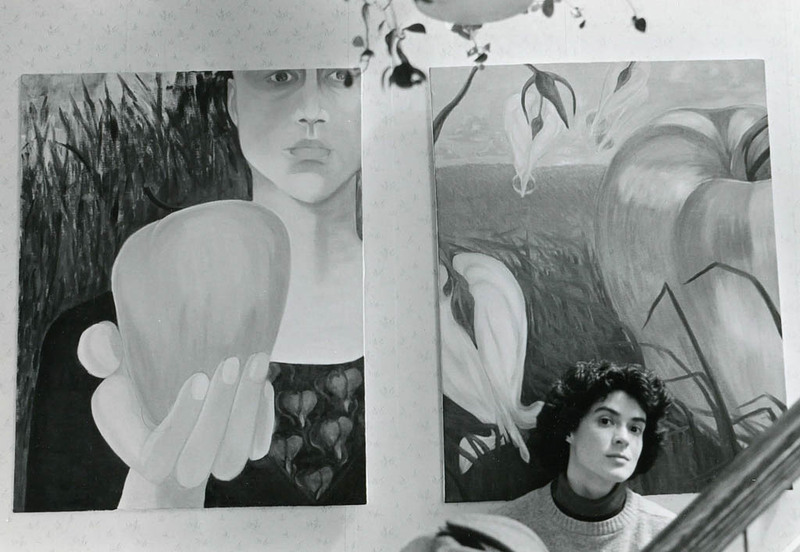 Gretchen with two of her paintings in 1986. Hubley Archives. 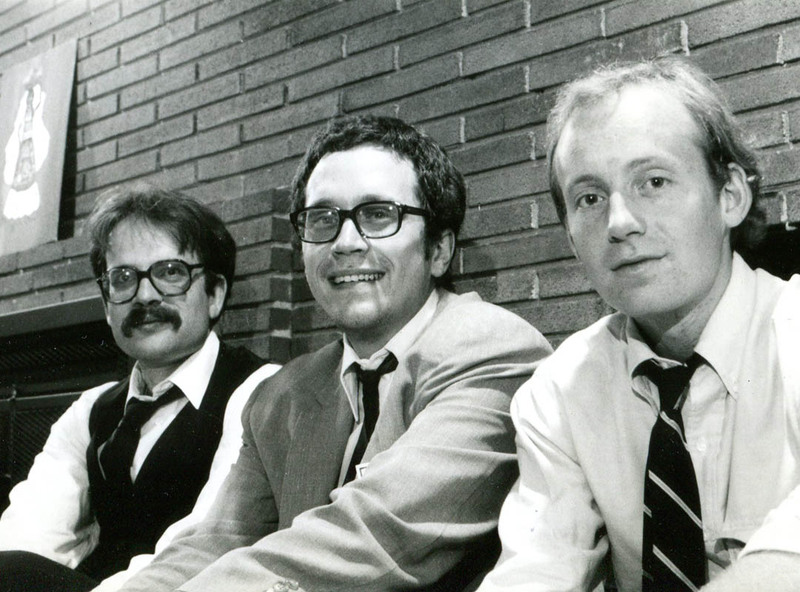 For two years I had worked full time in the library at the Guy Gannett newspapers in Portland, but at the same time I was writing arts and entertainment stories for those papers on the side. 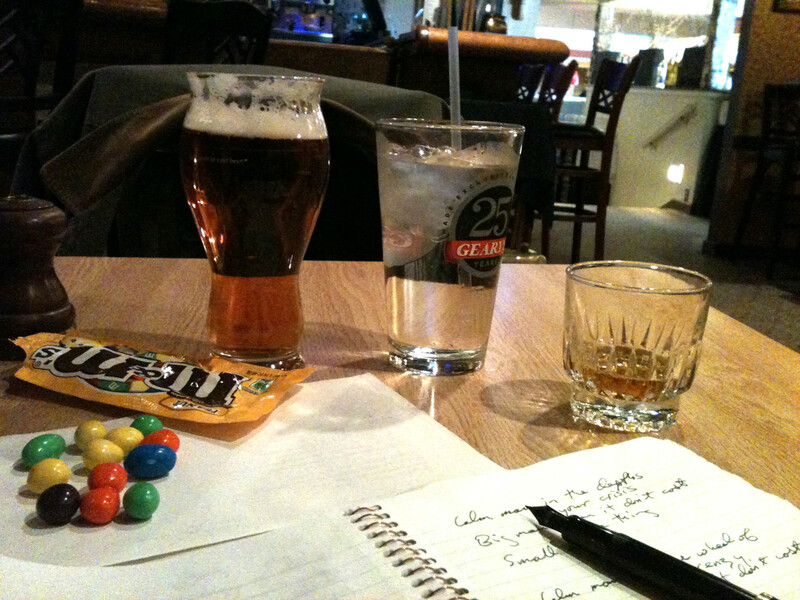 That work was much more fulfilling — and the pace was picking up, to the extent that it was a challenge to work writing assignments in around the library job. 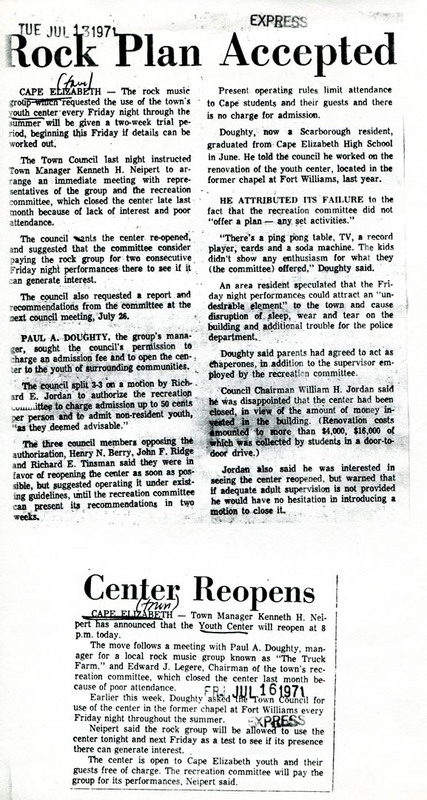 When Gannett put out a call for occasional copy editors, work that appealed to me and paid well, I saw my ticket out of the library and its endless routine of clipping, filing, retrieving and refiling news stories. Between copy desk shifts and writing, I figured I could make a decent living doing work I liked. 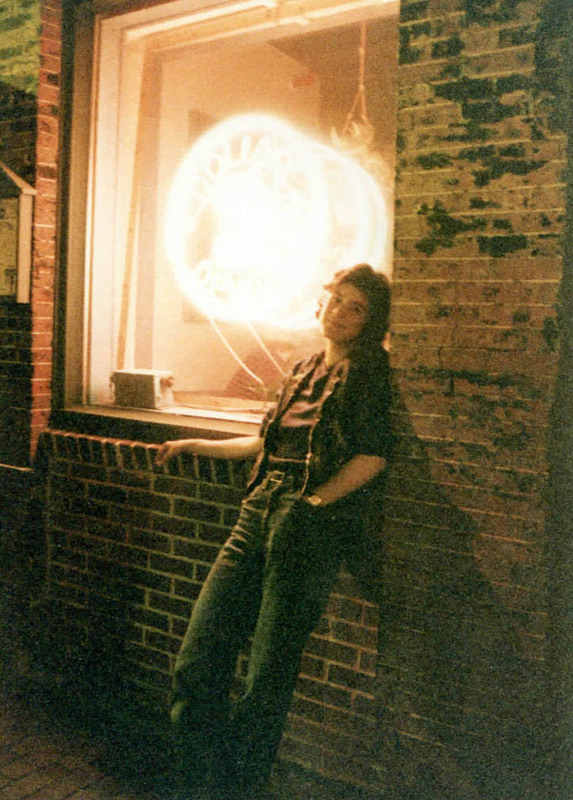 Doug at Geno’s in 1985. Jeff Stanton photo. For a few years, that’s how it worked out. But the real benefit was over the long haul, as the journalistic and editorial experience I gained in the second half of the 1980s continues to stand me in good stead even now. 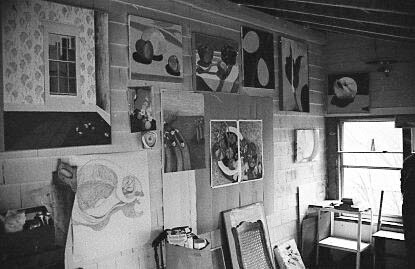 Gretchen, meanwhile, was painting and making prints as intensively as she could, given the constraints of her job at a high-end photo processor and of that cramped attic apartment. And in fact, in a June when auspicious events seemed to fall into place like tumblers in a combination lock, she became manager of an art gallery on Congress Street. If this was not quite fulfillment for an artist, it was motion in the right direction and valuable exposure to the business of art. So in this Year of the Creative Renaissance, our lives were largely about creative work: making our own, contemplating others’, talking about it all. 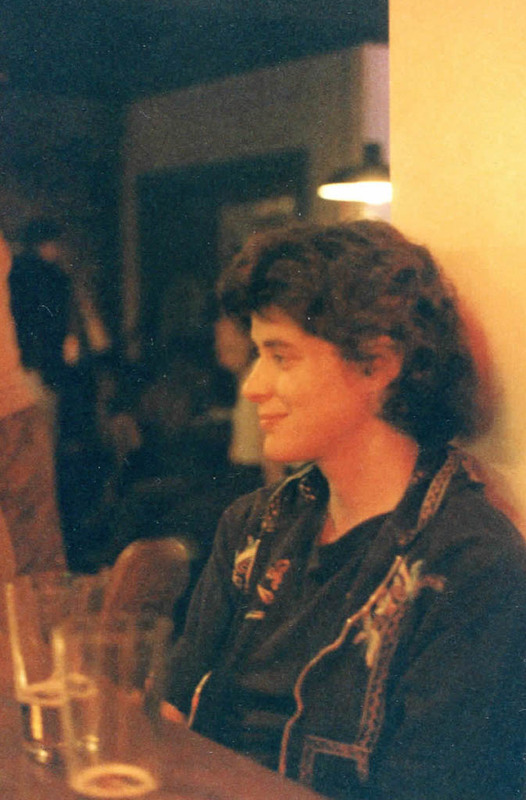 On June 8, over bourbon and Coke, Gretchen and I hatched the idea of the Visible Gallery: a gallery / open studio / performance room where, of course, fulfillment would reside with us and money would come in with the tide. We called it the Visible Gallery because of the open-studio idea: like the anatomical toys of the 1960s, all the guts would be on display. 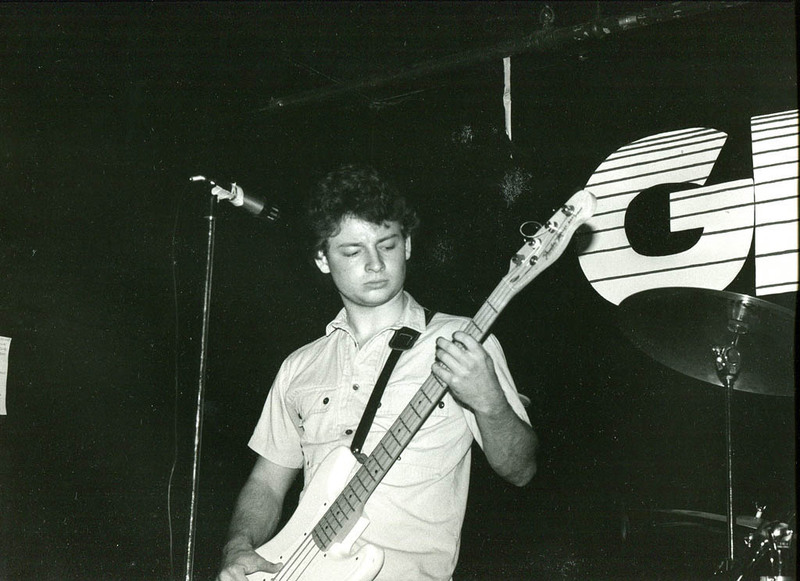 Bassist Dan Knight during a 1985 Fashion Jungle performance at Geno’s, Brown Street, Portland. Jeff Stanton photo. 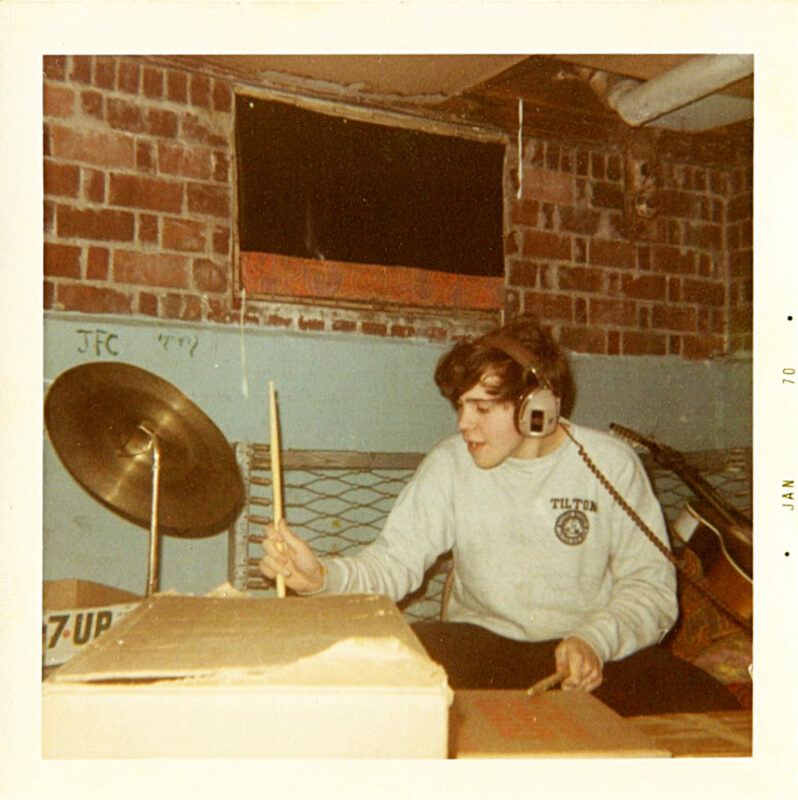 We all took a turn calling it quits, but the decisive blow came when drummer Ken Reynolds was hired full-time at the post office, working six evenings a week. 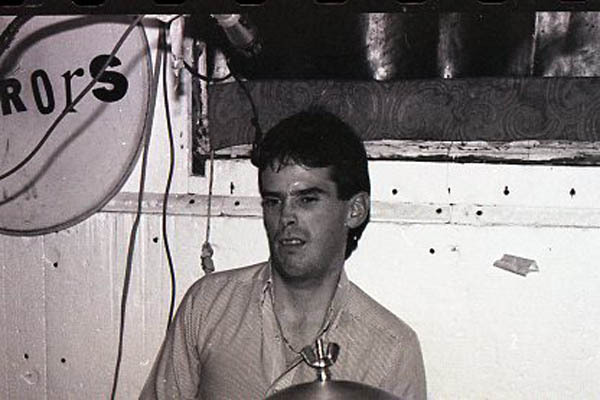 Ken and I had played together for eight years, and the propect of breaking in a new drummer seemed insurmountable. 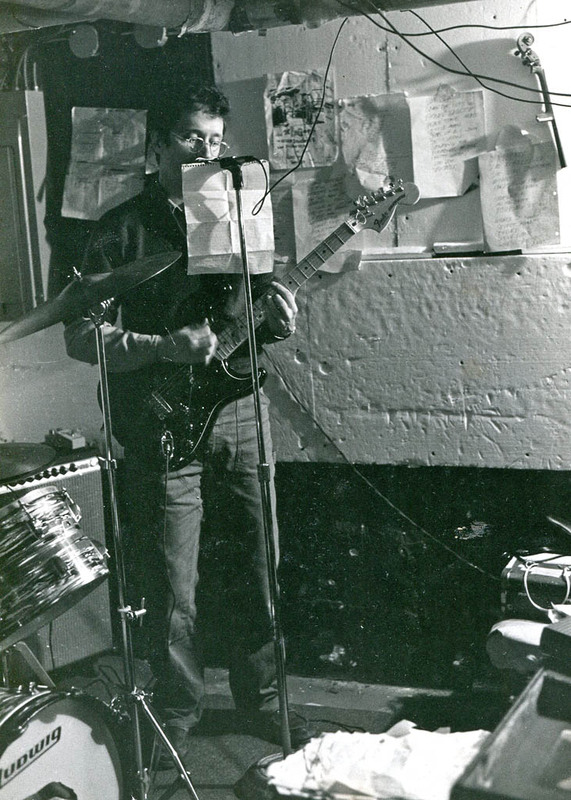 But in March 1985, just a month after that development, Ken switched from second to third shift, and was once again able (and willing) to rehearse. 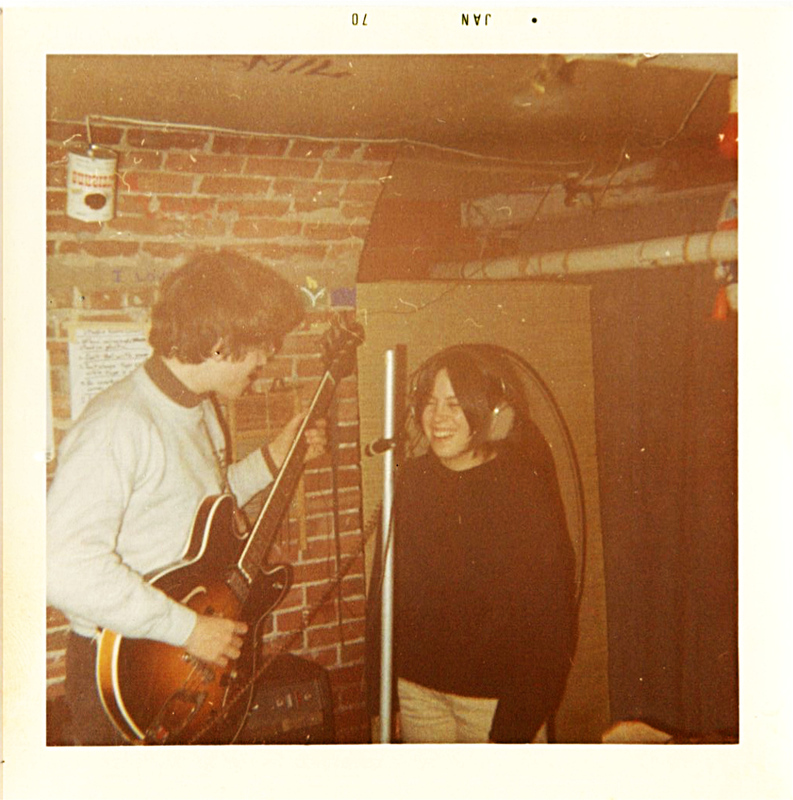 An ad in Sweet Potato produced Dan Knight, a young University of Southern Maine student who was friendly, earnest and a good player conversant with an impressive variety of music. We took him on in early July — and promptly accepted a July 27 booking, back at Geno’s. Hmmm, I wonder where this was taken . 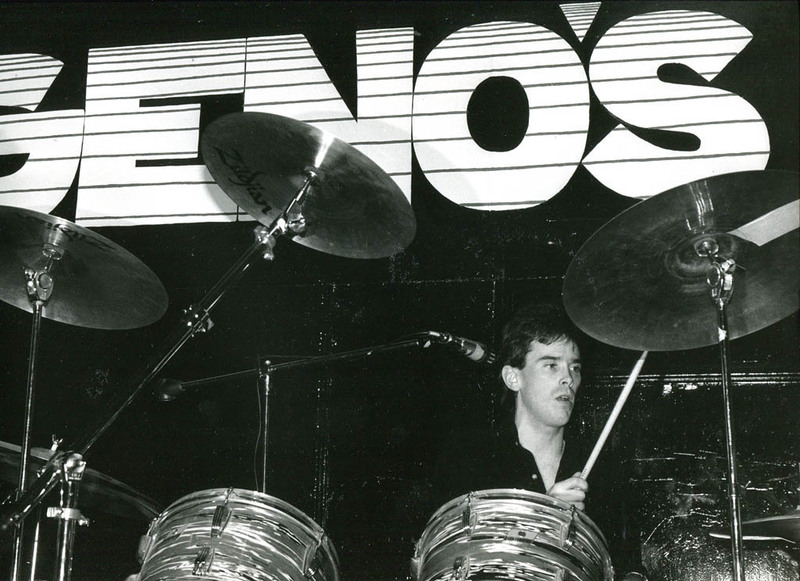 . . Ken Reynolds during a 1985 Fashion Jungle performance at Geno’s, Brown Street, Portland. Jeff Stanton photo. Dan absorbed the FJ material quickly, no mean feat considering its complexity. 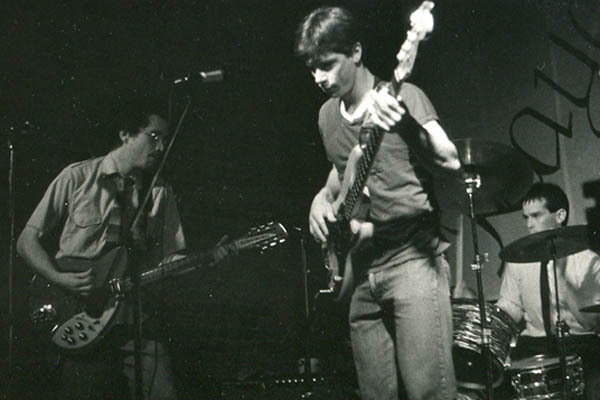 Like that of Steve Chapman, his predecessor, Dan’s playing was fluent, but it was much more reflective of the bass vernacular. 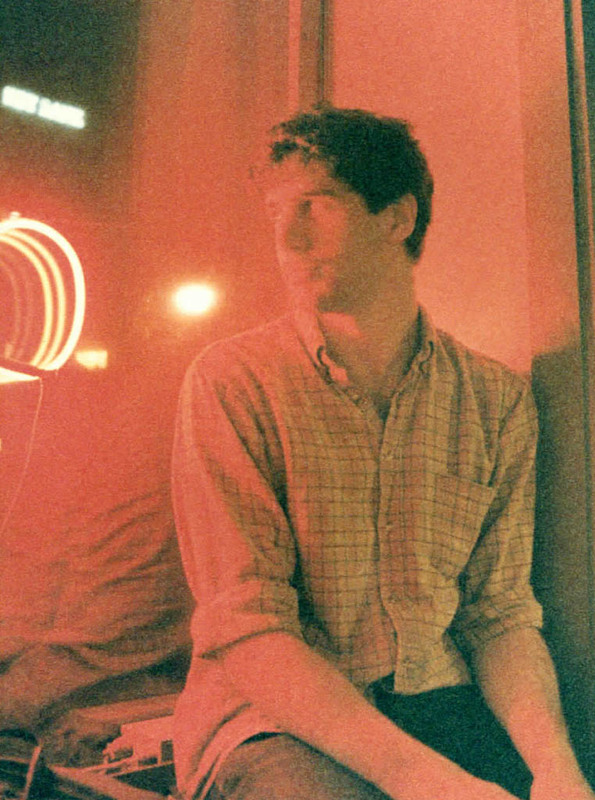 Steve’s playing was big, romantic and in a style unto itself. In Dan, you could hear decades of roots music and pop radio, organized with witty energy into a burbling, driving stream. 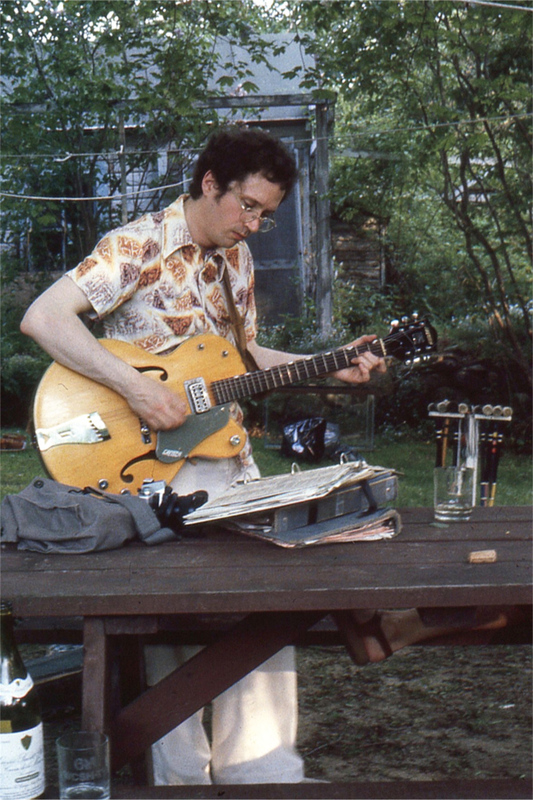 It’s a question how much of Dan’s style was driven by his equipment. It’s possible that he needed to play a lot of notes because, as a student, he couldn’t afford the gear to get a more sustaining sound. 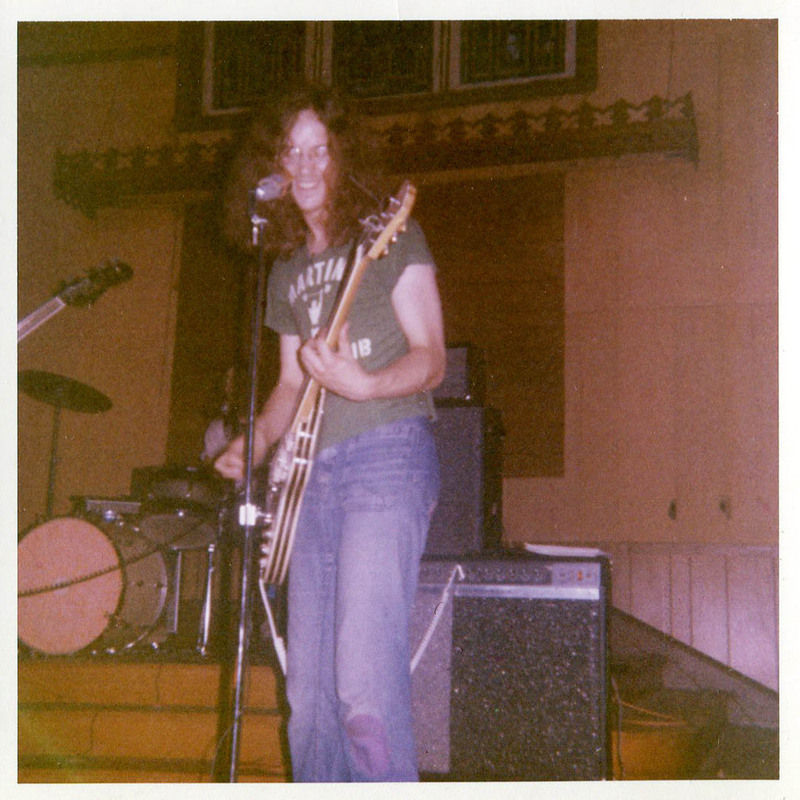 He used a succession of inexpensive basses, including my Hagstrom, a flatulent device with whimsical intonation; and I don’t think he ever got a bass amp powerful enough to stand up to the FJ decibel level. 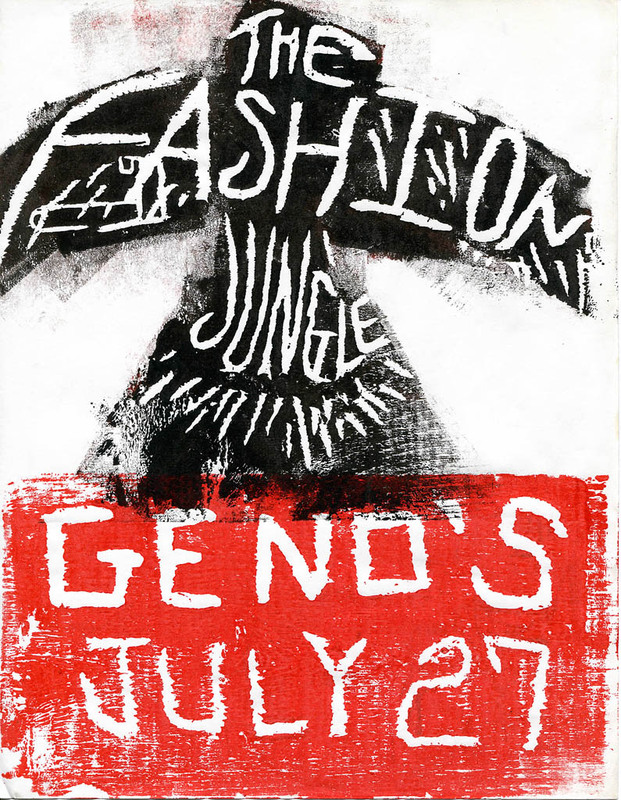 A poster by Gretchen Schaefer depicts the FJ rising from the ashes for a Geno’s gig. 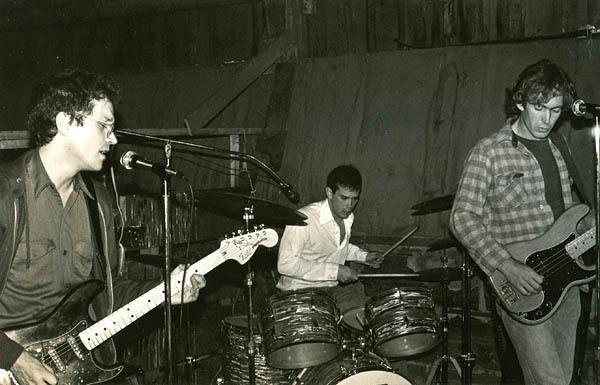 We played a bunch of times, including three dates at Geno’s and the wedding of Ken’s friend Doug Czerwonka, held at the Lost Valley ski resort in Auburn in October. We learned a bunch of totally unlikely songs for that job, from “My Girl” to “Get Off My Cloud” to “Una Paloma Blanca” to “Come Fly With Me” (awful) to Myron Floren’s “Fingertip Polka” — the start of a pesky polka obsession for me. Creative Renaissance! 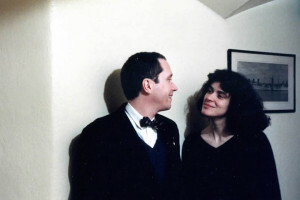 As hard as we were pursuing our creative pursuits, Gretchen and I were also putting more energy into our social lives, thanks to work schedules that accommodated late nights. 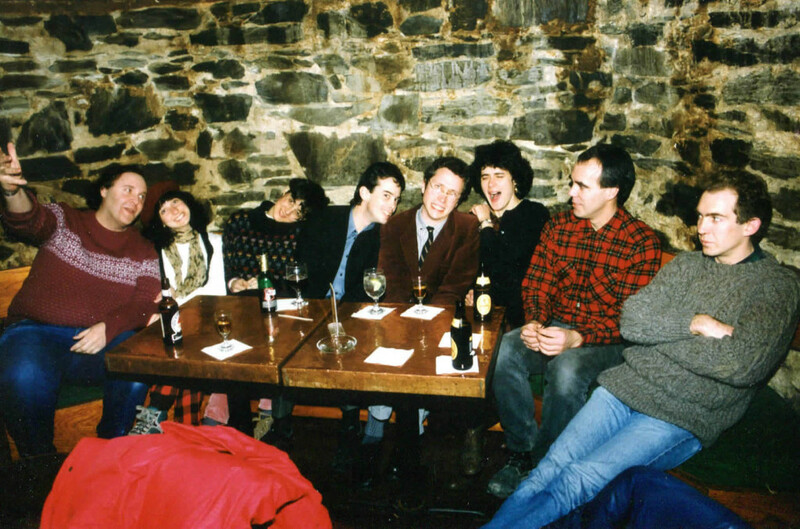 Somewhere along the way we launched a series of Monday-night “boozeness meetings” — gatherings at Three-Dollar Dewey’s, in the original Fore Street location in Portland. The idea of the boozeness meetings was that Monday night was the time and Dewey’s was the place, and whoever felt like going would go, in the hopes that someone else would go too. For several months, that’s the way it happened: In addition to G. and I, we could often expect to see Jeff, Ken, former FJ keyboardist Kathren Torraca, our friend Alden Bodwell, and friends of the various friends. 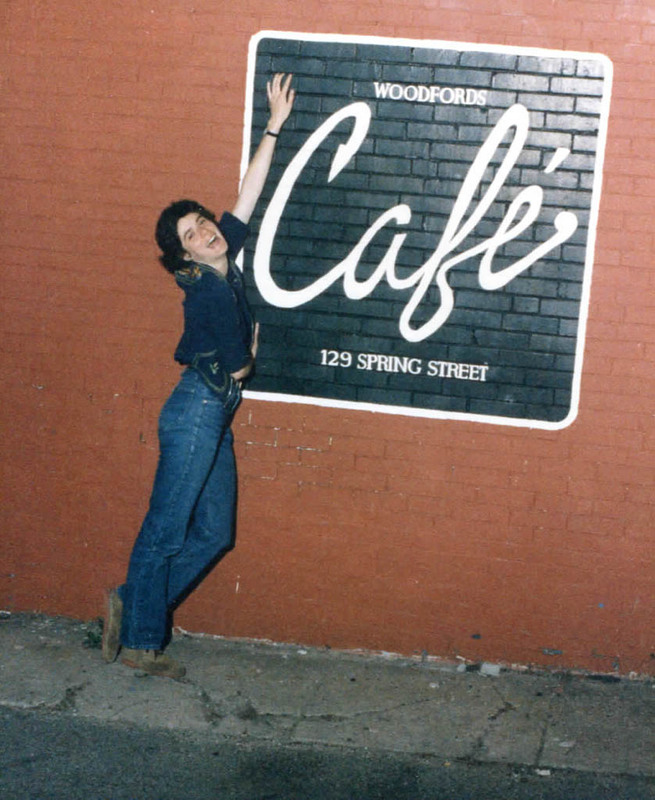 We’d hang at Dewey’s, maybe play cards, and wind up with a late visit to the Woodford’s Café for an English mufffin. 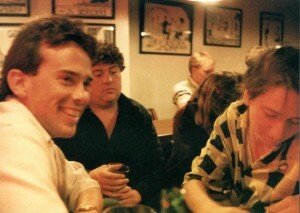 A Monday Night Boozeness meeting at Three Dollar Dewey’s, 1985. 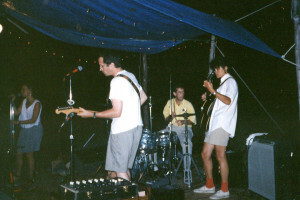 From left, Ken Reynolds, Chris Bruni, two unknown subjects, Kathren Torraca. At the same time, our connection with our friends was strengthened by the fact that we got our own playhouse. 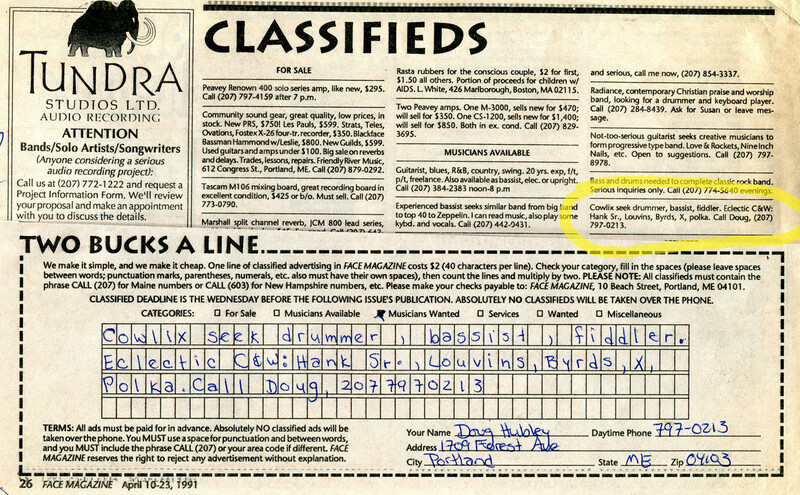 Gretchen and I had pursued the Visible Gallery idea, and placed a “space wanted” ad in which I blathered on in wry / exalted terms about what we hoped to achieve. This amused a Mrs. Orlando (husband: Tony) who was willing to rent us half of a one-story industrial duplex at 178 Washington Ave. It was perfect, a large open space accompanied by a bathroom and a small office. Good for painting, for rehearsals, for parties. 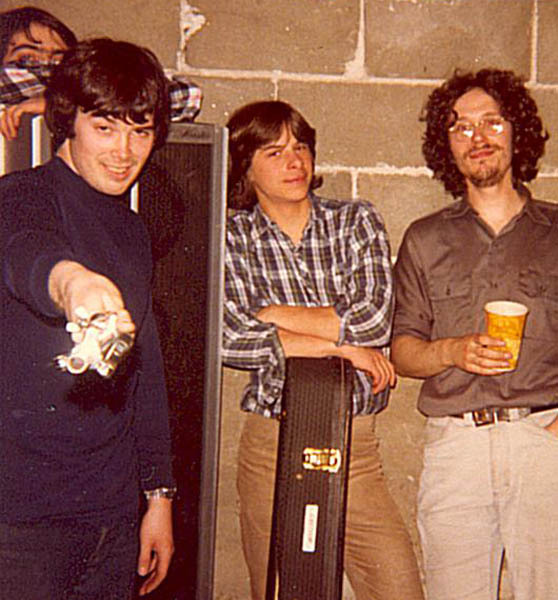 The best part was the truck door: For a gig, Alden could drive his van right into the rehearsal space for loading and unloading. 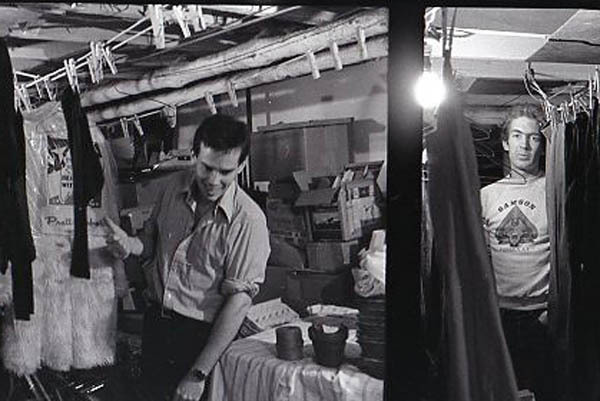 I can’t recall, or don’t want to, how much arm-twisting we engaged in, but in August 1985 we rented the Washington Avenue space as a collective: the Fashion Jungle with Jeff and Gretchen. 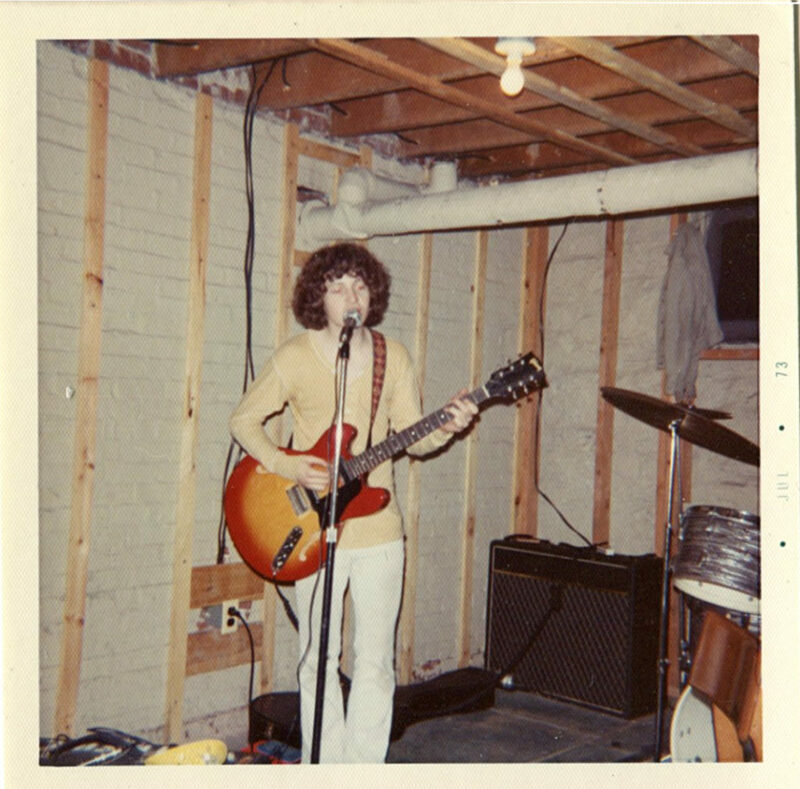 The last time I played music in my parents’ cellar was Aug. 28, 1985 — my diary notes that my mother seemed sad that rehearsals at 103 Richland St. were over, although I’m sure Dad was happy to lose the racket. Last night at the Body Shop — the warehouse space on Washington Avenue that was our clubhouse for five months. 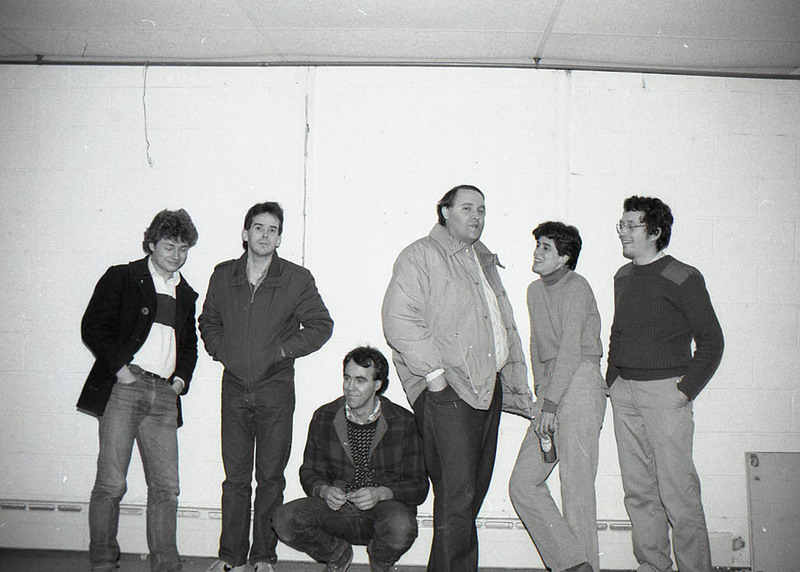 From left: FJ bassist Dan Knight, drummer Ken Reynolds, roadie-photographer Jeff Stanton, roadie-driver Alden Bodwell, roadie-artist Gretchen Schaefer, guitarist-commando Doug Hubley. 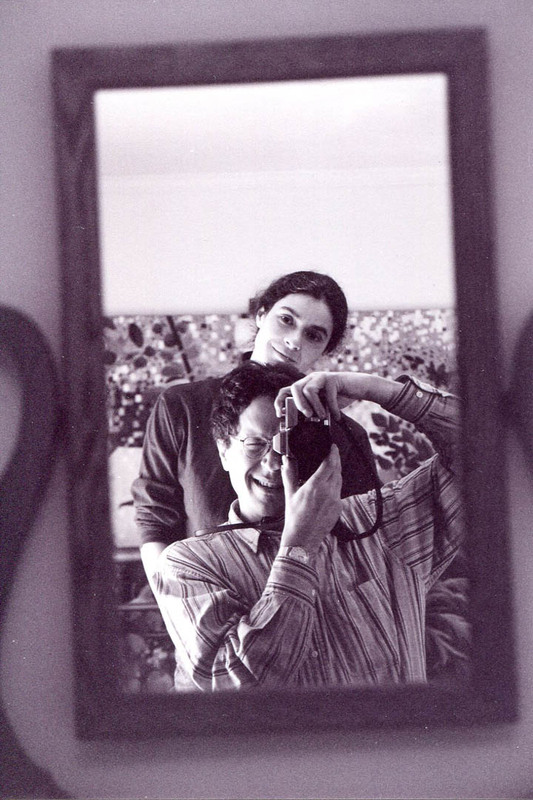 Photo by Minolta self-timer/Hubley Archives. We moved in at the beginning of September. We had good times at the Body Shop, as we came to call it in honor of a previous tenant. Naturally, it became a social club as much as anything. 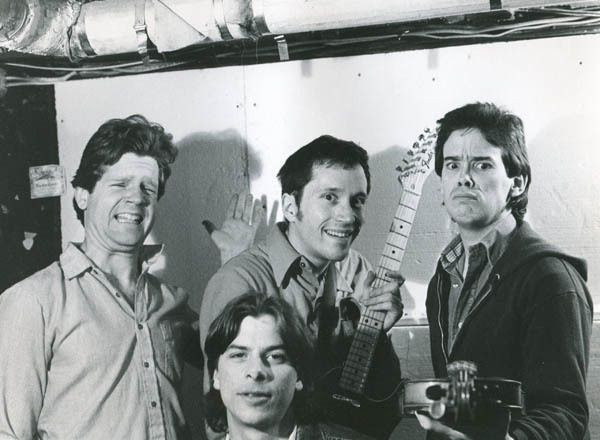 In fact, over the course of the few gigs that the FJ played while we were based there, I at least perceived a real solidarity amongst the six of us who were at Washington Avenue, and at the gigs, the most: Alden, Dan, Doug, Gretchen, Jeff and Ken. Romanticizing the writer’s life, 1985. I got over it. Hubley Archives. But problems soon became obvious with the Body Shop (we weren’t there long enough to bring the Visible Gallery to life). The biggest was that we simply couldn’t afford it. And despite our high ambitions, not everyone had a real use for the space. For Gretchen, who didn’t have a car, simply getting there on her own from South Portland involved two bus trips and a prohibitive amount of time. By November, the money crunch was exigent (the rent party was fun, but didn’t help the situation much). 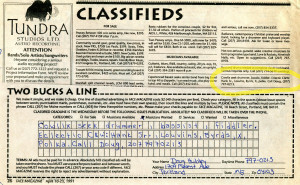 By December, Ken had given notice, muttering about going to California to work for the Defense Logistics Agency. Through January, we tried to record all of our material, not succeeding. 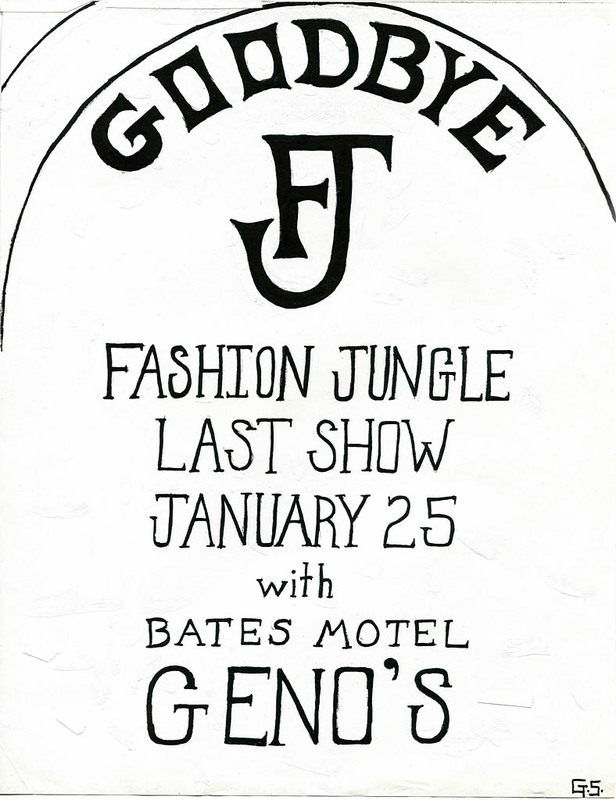 On Jan. 27, 1986, at Geno’s, we played what was billed as the Fashion Jungle’s last gig. Of course, it wasn’t. 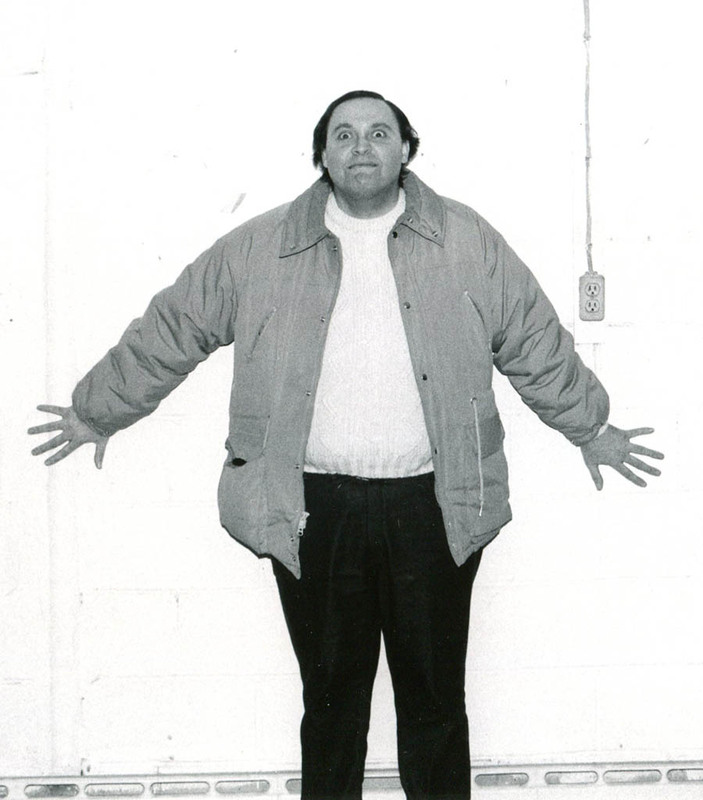 But it was the last time I set foot on a stage in 1986. 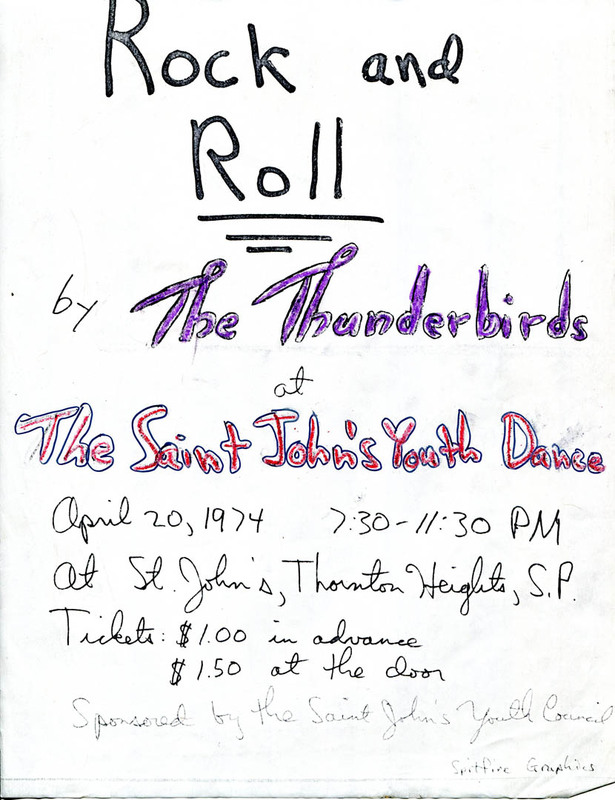 Gretchen Schaefer’s poster for what we thought was the FJ’s last performance. Hubley Archives. 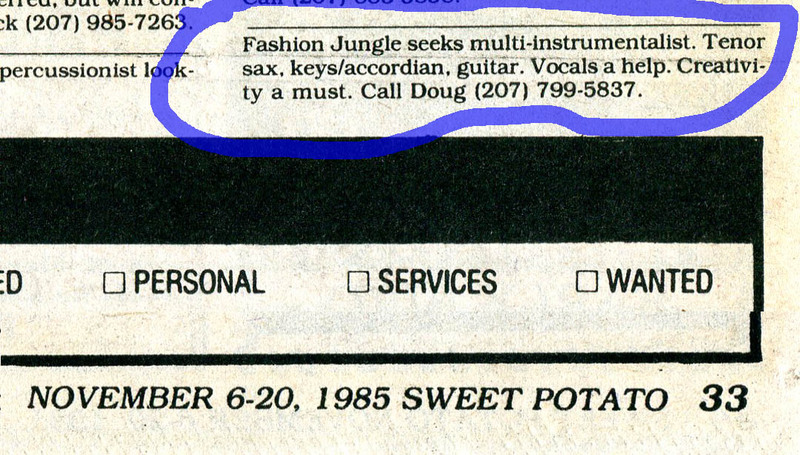 Hear studio recordings by the 1985 Fashion Jungle: We spent our last month at the Body Shop attempting to record our repertoire for posterity. 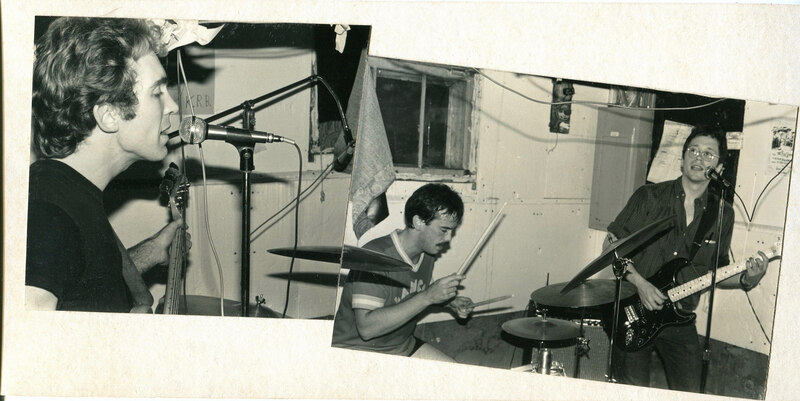 It had been a problematic space for recording because of a commercial radio signal that leaked onto the tape, but somehow we dodged that bullet for these sessions. 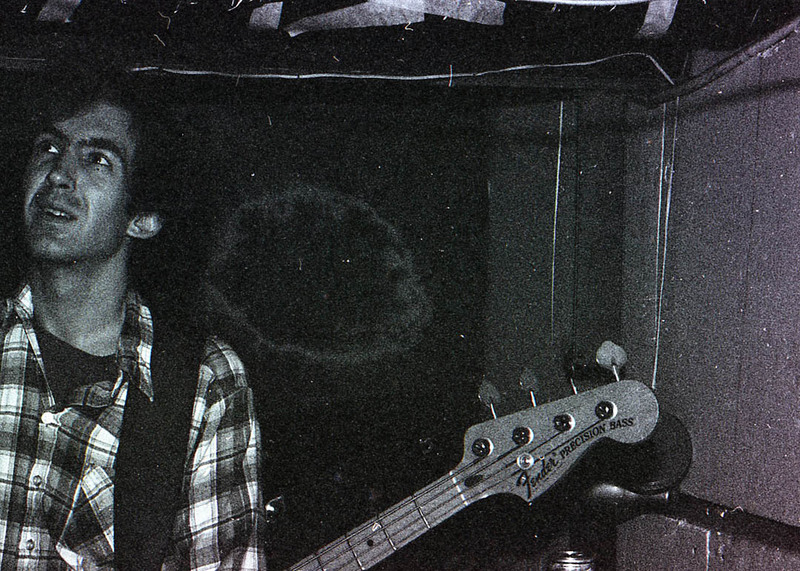 Dan Knight, bass and vocal (“Blood From a Stone”). Ken Reynolds, drums. 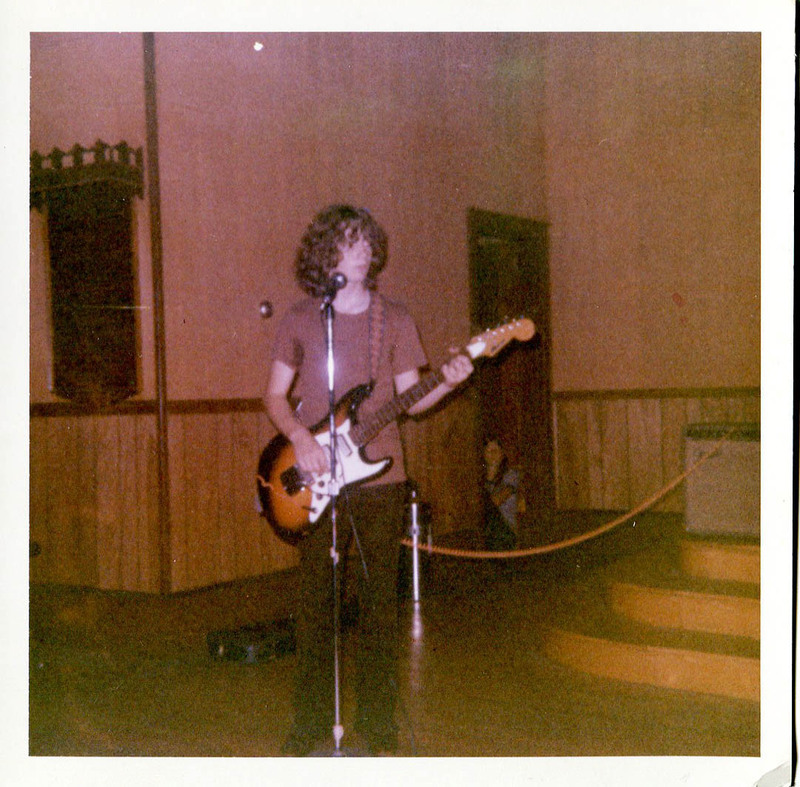 Doug Hubley, guitar and vocals. Recorded at the Body Shop on the Sony TC-540. 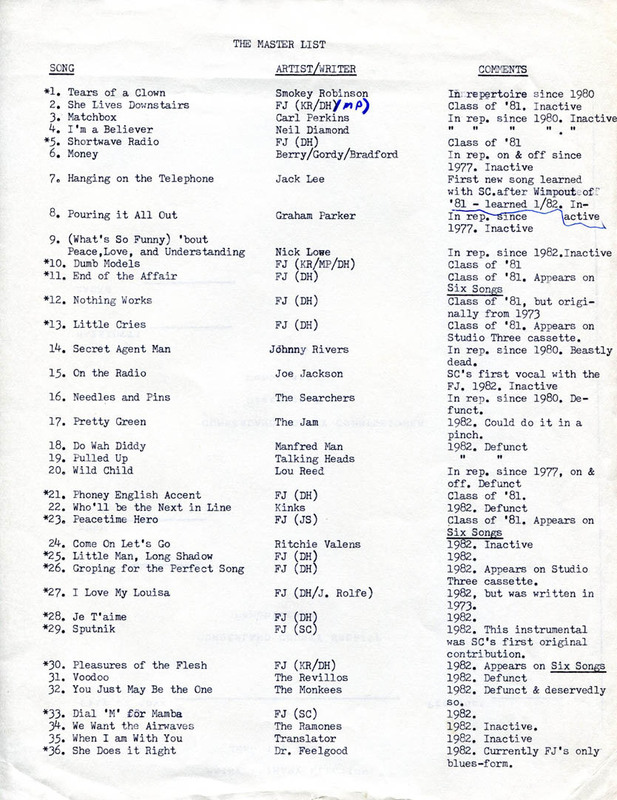 Phony English Accent (Hubley) Bitchy and self-righteous enough that I regret it now (but not enough to withhold it), this standard from the original Fashion Jungle was my response to the posturing that had infected American punk and New Wave by the early 1980s. Hear an earlier version. 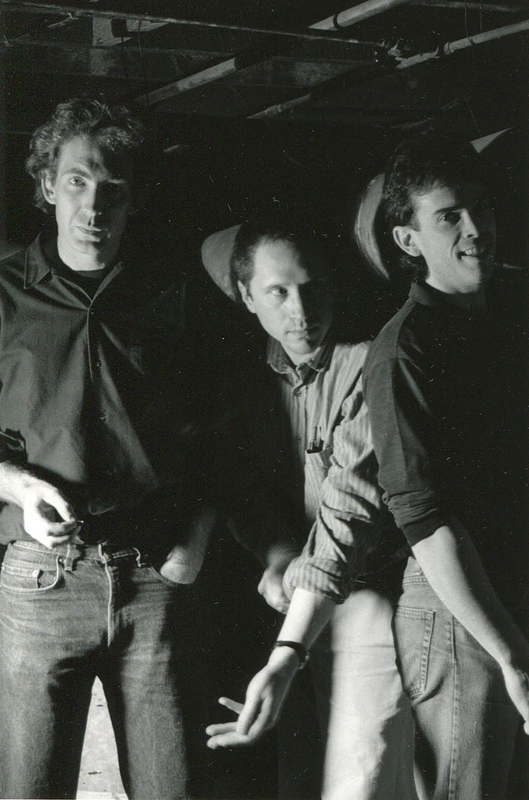 Why This Passion (Hubley) The original version of this song written for the Fashion Jungle in 1983 was a rococo creation that could barely stand up under the weight of its arrangement. For the 1985 FJ, I streamlined and supercharged the setting, to better effect. Corner Night (Hubley) Unintelligible to anyone who wasn’t close to the 1970s-’80s social scene around Patty Ann’s Superette, in South Portland, these lyrics were written in 1981 about two concerts given by three bands with ties to that scene — the Foreign Students and the Pathetix, in addition to the FJ. 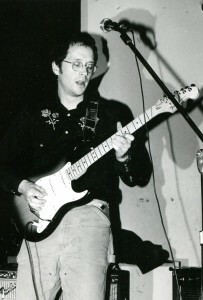 I contrived the Costello-esque melody in 1985 for the reborn FJ. Hear an earlier version. Coke Street (Hubley) In the 1980s, Portland’s Old Port Exchange was the go-go ’80s writ large and embellished with seagulls. This country song with its odd lopsided rhythm was one of my rare attempts at social commentary. 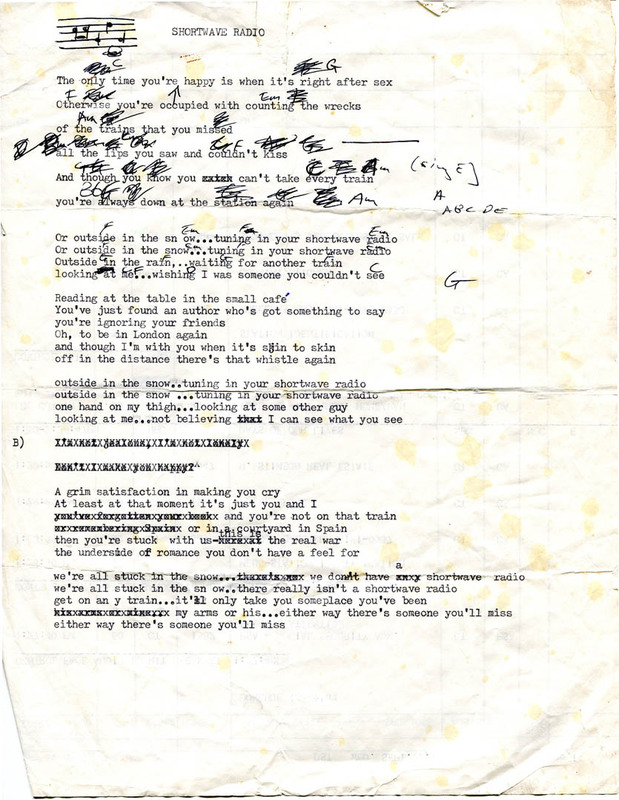 The lyrics absolutely do not hold up (“Love letters on an Apple II”? ), but the music is cool. Hear an earlier version. Blood From a Stone (Knight) This Byrdsy number was bassist Dan Knight’s contribution to the Fashion Jungle catalog. 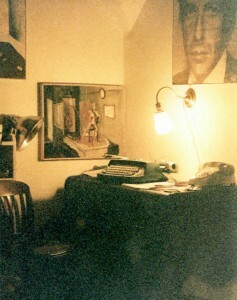 “Phony English Accent,” “Why This Passion,” “Corner Night” and “Coke Street” all copyright © 2010 by Douglas L. Hubley. “Blood From a Stone” copyright © 1985 by Daniel B. Knight. All rights reserved. 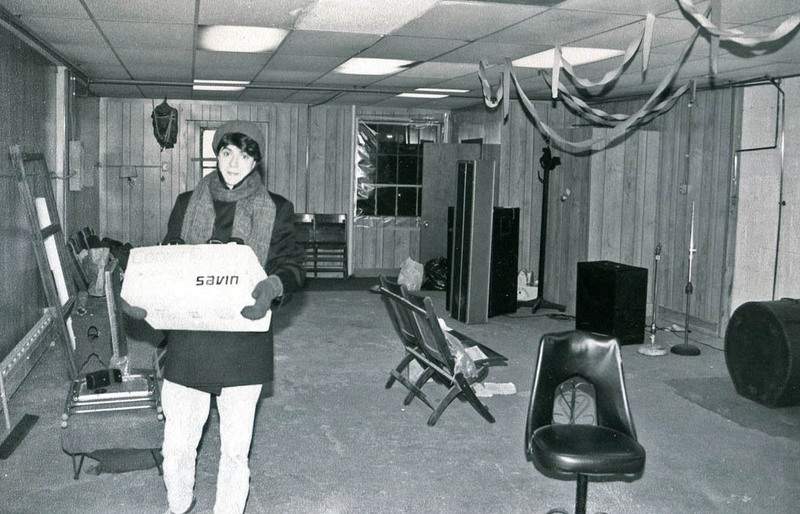 Gretchen Schaefer lugs a box out of the Body Shop during the 1986 retreat. Hubley Archives. 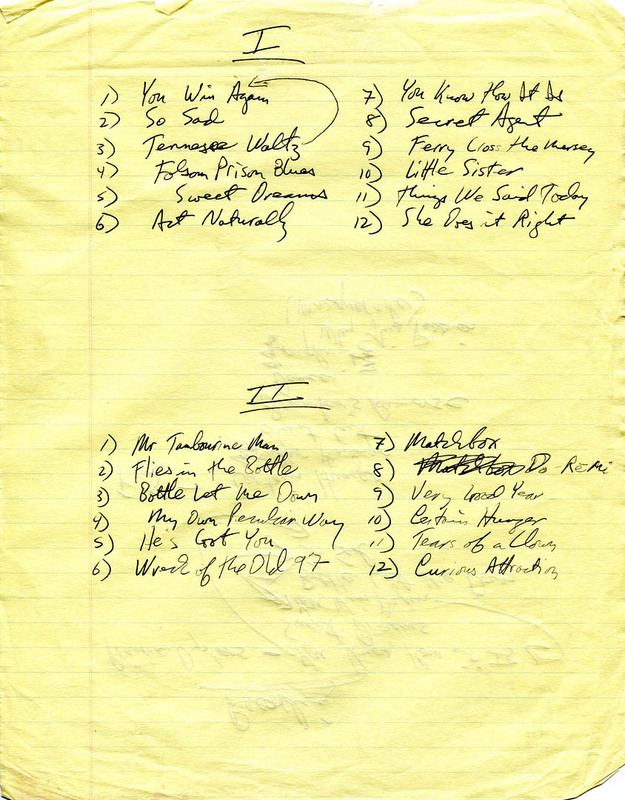 Track listings for two reel-to-reel recordings by the Curley Howard Band in my Tape Catalogue. The comment indicated by the arrow sums up this entire post; click to embiggen. Skip philosophizing! Go directly to music! 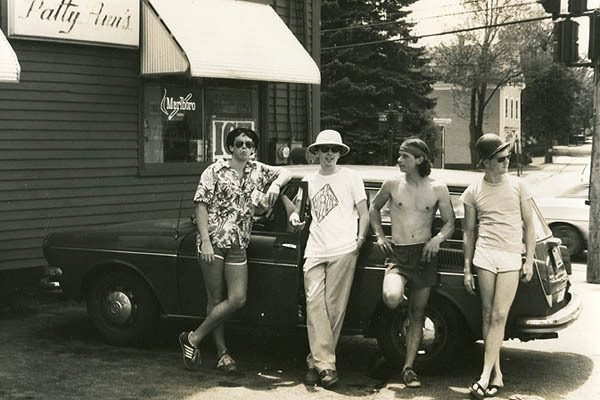 See a mind-bending collection of items from the Hubley Archives. And it’s only the tip of the iceberg! This Kodak Instamatic (not Instagram, Instamatic!) 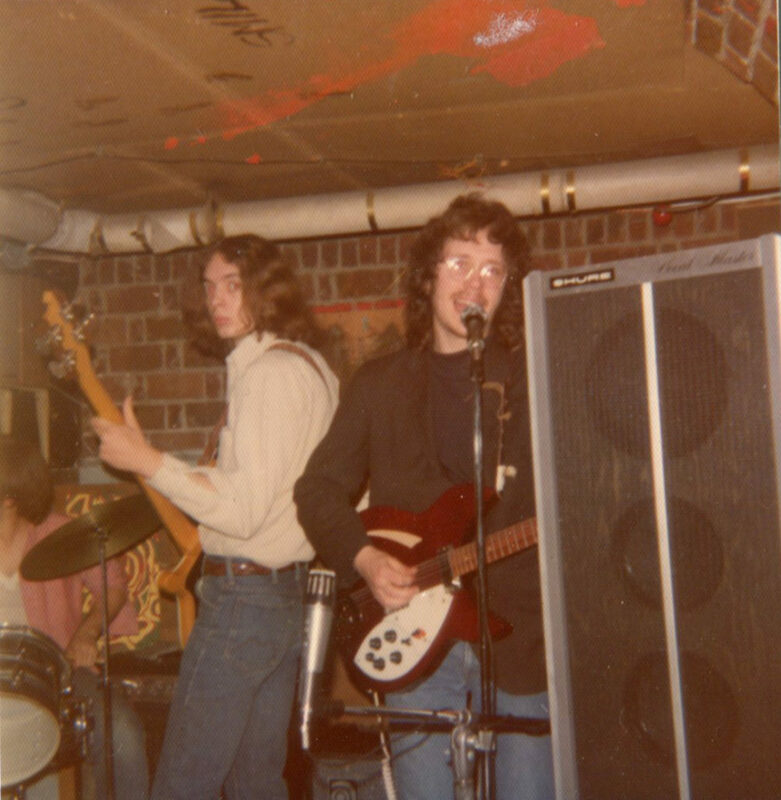 image from winter 1971 shows three of the four members of my first performing band, Truck Farm, which came together later that year. 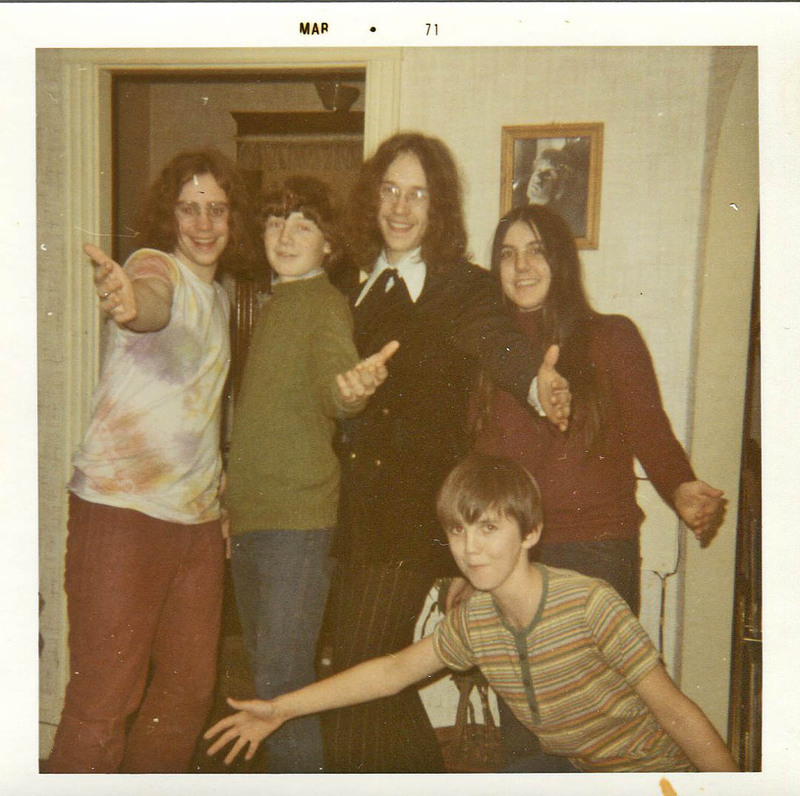 Clockwise from left: Tom Hansen, drummer; John Rolfe, guitarist; DH, dolled up for who knows what; and our friends Patty Stanton and Scott Stanton. Hubley Family photograph. When you see people close to you losing their memories, and your own is less than rock-solid, it may cause you to think seriously about what you remember. And what it means: the role memories play in your thinking and in your understanding of your life. The ways you call memories up, examine them and try to hold onto them. The fact that they are so plastic, and ultimately fugitive. A South Portland police officer pays a visit to an early Truck Farm rehearsal en plein air at Craig Johnson’s house. 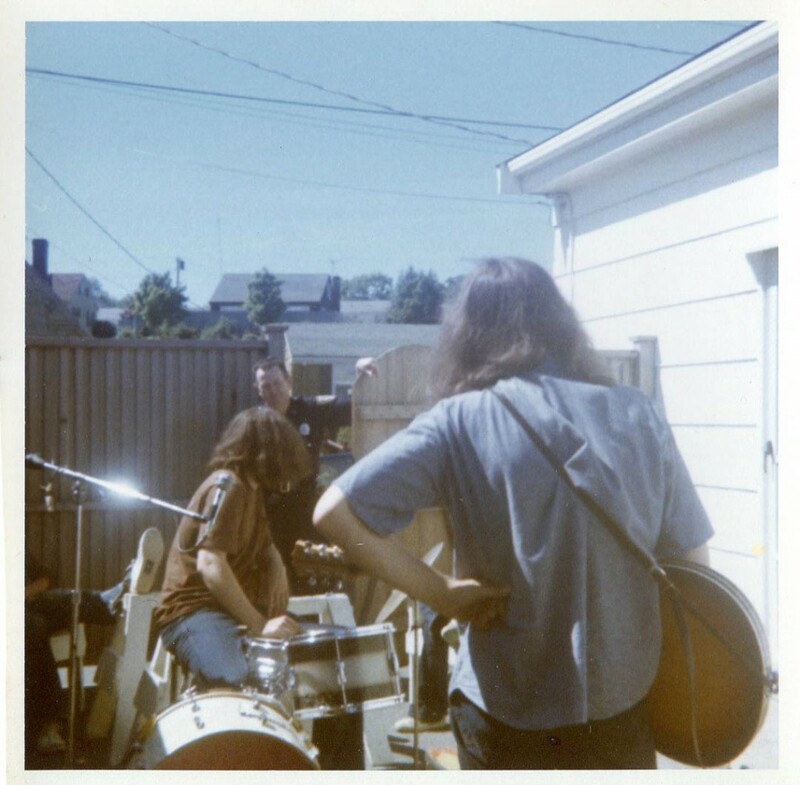 I still hear him saying, “Can you tone it down a little bit, boys?” I’m at right and Tom Hansen at left in this image by an unknown photographer from spring or summer 1971. Hubley Archives. Are we merely the sum of our memories? Do they accrete onto the bare armature of our personalities like layers of clay? Can you do anything with your conscious mind that isn’t somehow connected with memory? How is it you can not see somebody for two years, and then when you meet again, you pick up the conversation like it was just yesterday? Why are memories of life experiences — the stories that seem to constitute our lives — so important to some people, like me, and not others? See a gallery of Truck Farm Images. Text continues after gallery! See the Archives page, offering way too much information. 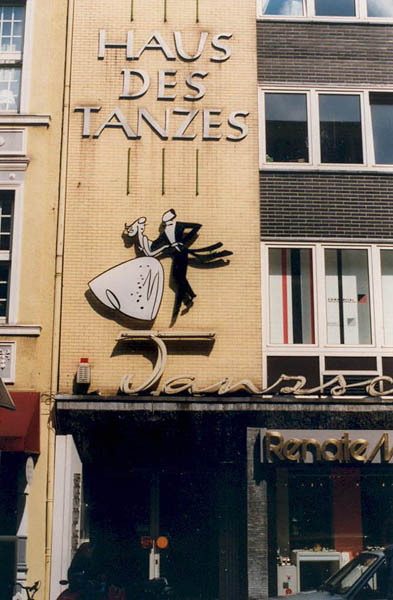 I had a great memory, with a particular facility for dates, into my 40s. 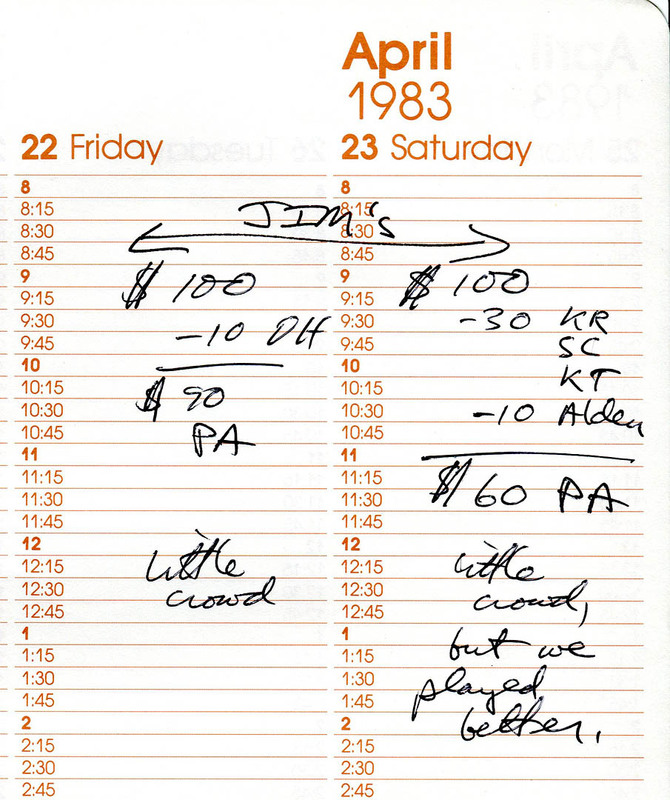 I had a reputation for my ability to recall the dates when things happened, even fairly unimportant things. 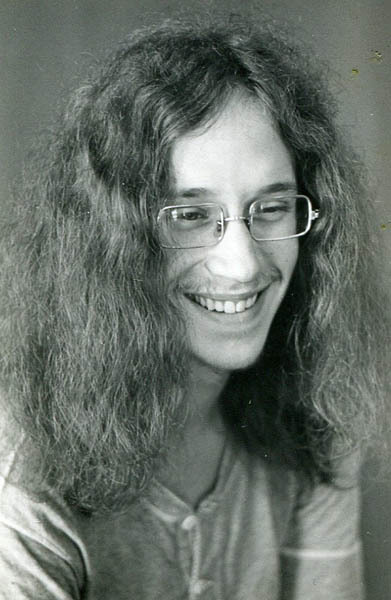 Example: On Oct. 24, 1970, my mother took Tom Hansen and me to see Poco at the University of Maine Portland-Gorham. My sticky memory was one of the primary colors of my sense of self. Now it’s fading, not drastically, but noticeably. As with the other things that age has diminished, I accept it, because what else can you do? But it dulls my self-esteem and leaves a numb spot in my mood, like the flat place on your gums where a tooth used to be. 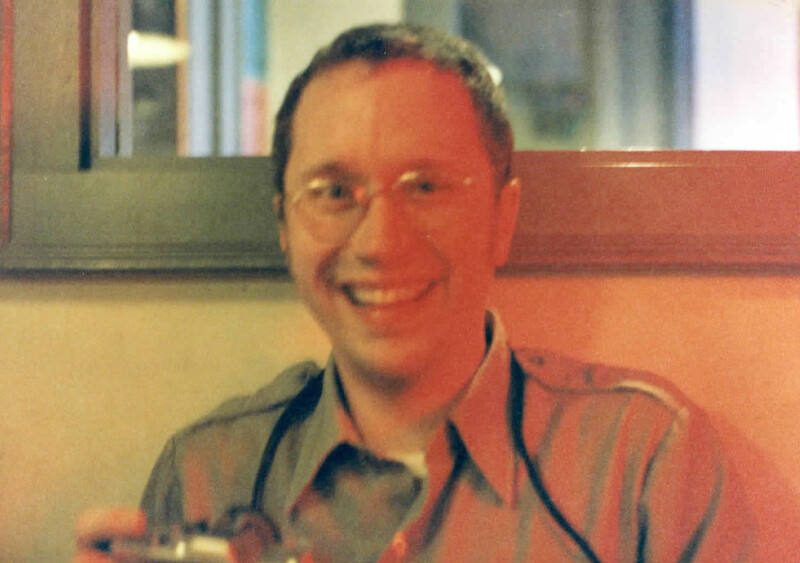 Self-portrait with Sony TC-540, 1982. At worst, it worries me that it’s the start of some kind of serious deterioration. But I try not to go there too often. 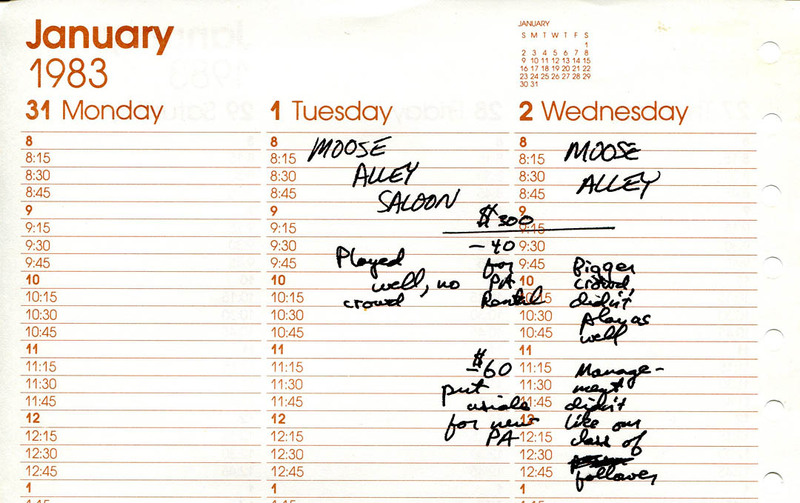 I’ve always associated memories with documentation. 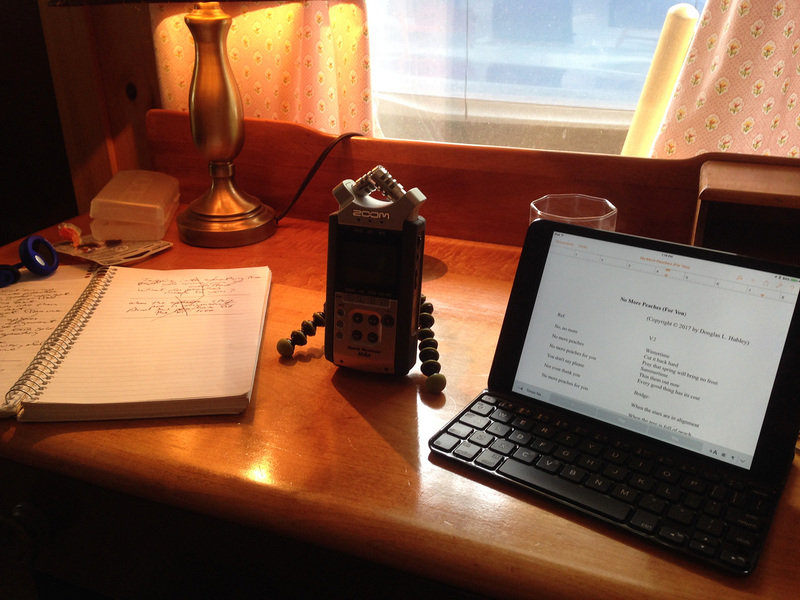 For me, a piece of paper or a recording is like a ticket to something I experienced. It’s hard to say which came first, this belief or my paper-saving habit, but I’ve amassed a lot — lyric sheets, newspaper clippings and night club listings, set lists, photographs, performance and rehearsal recordings, letters, journal entries (way too few of those), etc. And that’s just the stuff related to music. 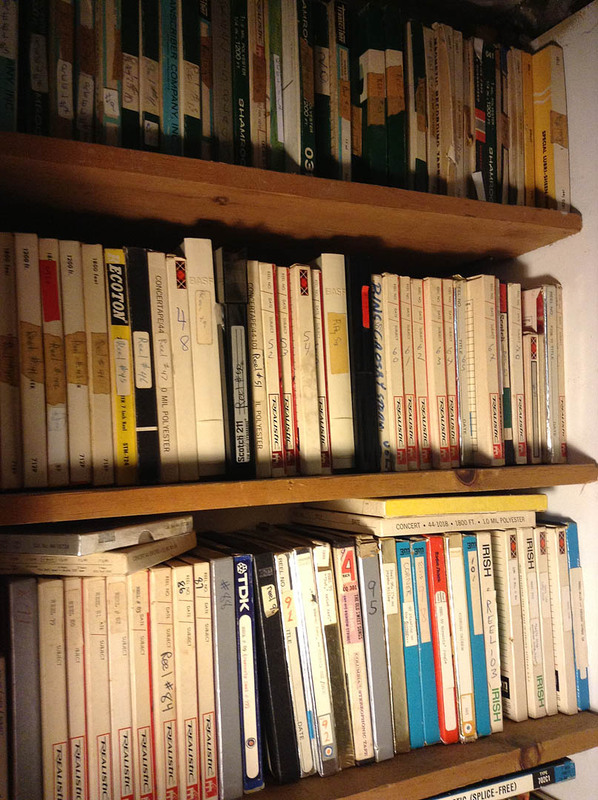 One of the most robust sources for these strolls down Memory Lane is the “Tape Catalogue,” my extremely annotated index of most of the analog audio tapes that I own, about 130 reel-to-reel tapes and god knows how many cassettes. These are life experiences of a especially vivid kind that are embedded in physical objects, and for the most part, the objects are unique. 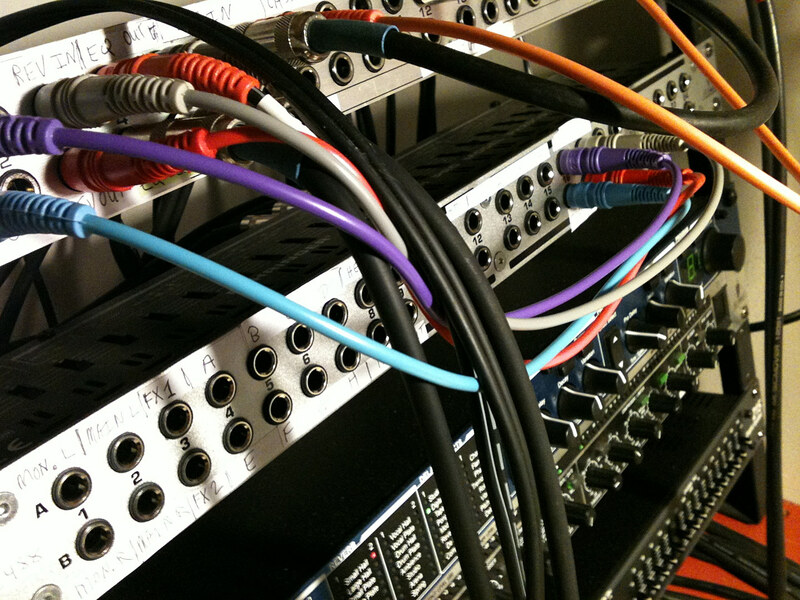 You can copy an analog recording, but always with a loss of quality, vs. a digital recording, which is endlessly replicable with no loss of quality (except the upfront loss of quality inherent to digital recording). That replicability is one reason digital audio media are disorienting to a product, like me, of the analog age. A slightly different reason has to do with physicality. Digital recordings ultimately exist as physical media, of course — on a server somewhere — but you don’t need to have them in your house to access them, and you don’t have to own them to access them. How unsettling. I am all about owning things and having them in my house. Can you really get anything from a Cloud besides vapor, rain or snow? But ultimately all our endeavors, and their physical manifestations, will evaporate anyway, no? I’ve always believed that by revisiting the document, the experience will somehow spring back to life fully formed in my mind. In the nine months I’ve been writing these posts, though, the mnemonic payoff from all the paperwork hasn’t been quite so dramatic. It has been nice to rediscover the facts in the documents, but the big payoff — the once forgotten, now recalled scene in the Movie of Doug — has rarely been forthcoming. 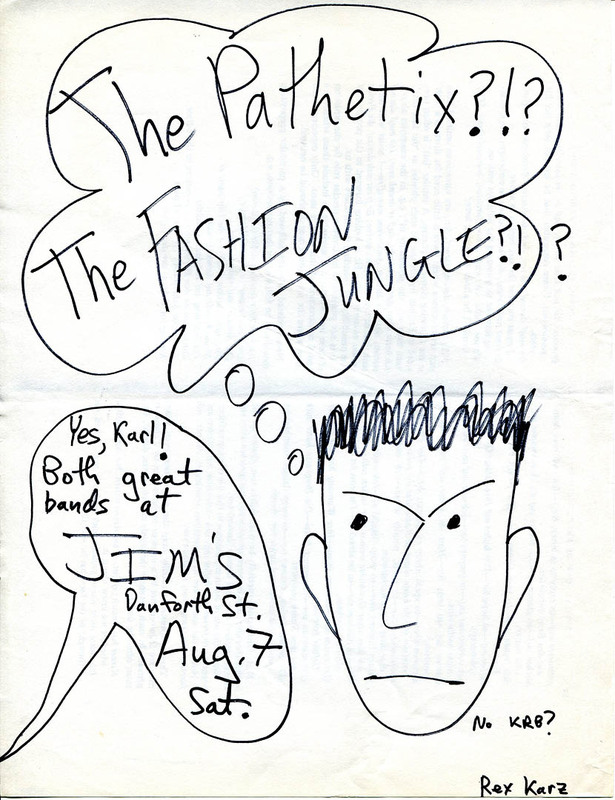 A page for a chronology of my bands that I drew up in preparation for a never-completed 1985 slideshow about the rise and fall of the Fashion Jungle. 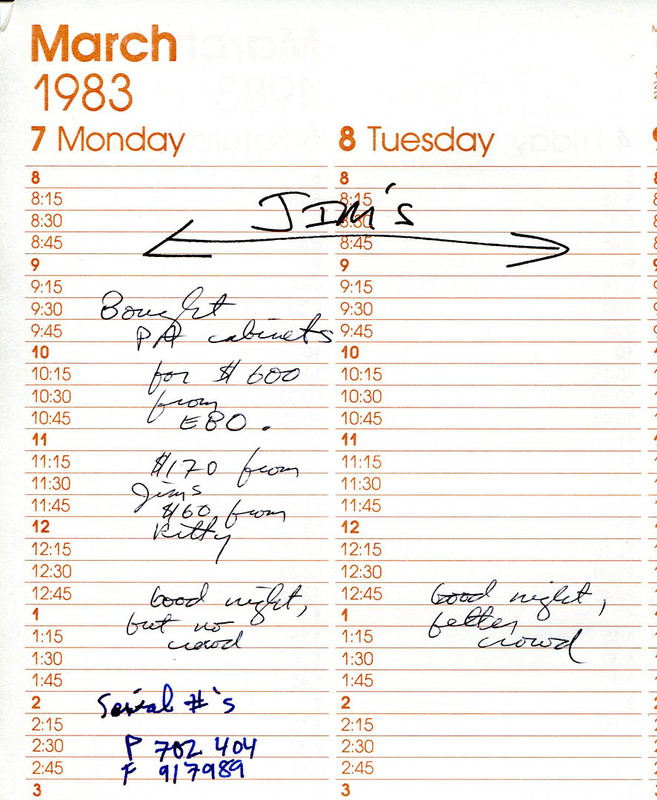 Note the March 1983 entry. Hubley Archives. So documentation isn’t the key to a lockbox full of precious memories. There’s not always even an exact correspondence between one paper item and one recollection. The best I can hope for is random and fragmentary recovery of memories from the abyss. For instance, this autumn I was surprised to be reminded that the Chapman-Torraca edition of the Fashion Jungle stayed together (to the extent we could, with members living in Boston) until March 1985. 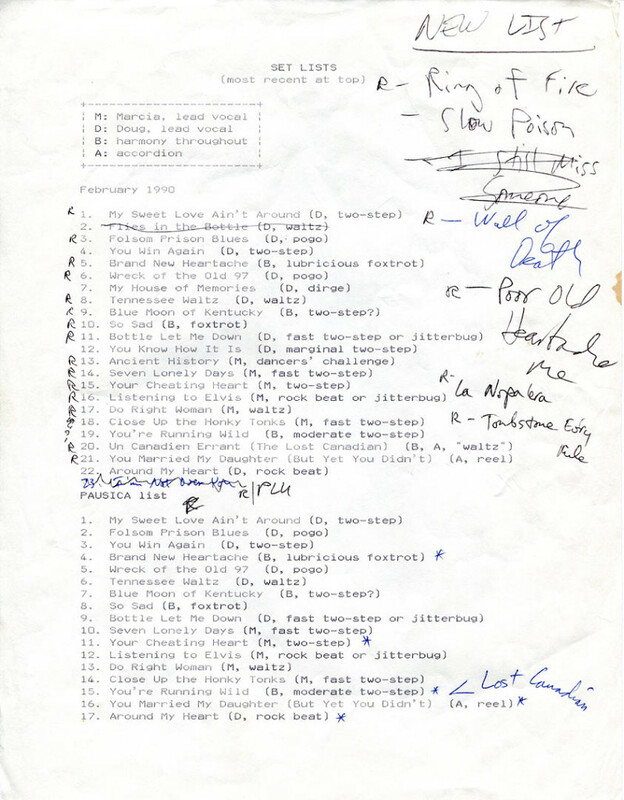 This intelligence came from a handwritten band chronology that I started back in the 1980s, when I was really manic about documentation, and that I just unearthed. From a hasty logbook of Fashion Jungle operations that I kept in 1983, I was able to disabuse myself of the erroneous belief that Kathren Torraca’s FJ debut was at a certain club on a certain date and relearn that it was at a different club, good old Kayo’s, on an earlier date. The big takeaway there was not so much the facts of her debut, but the realization that I’d remembered them wrong all these years, just because I had a tape of one gig, her second with the FJ, and not of her first. The documents give and the documents take away. 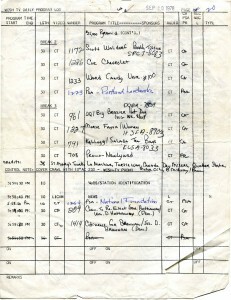 See the logbook and other Fashion Jungle images. 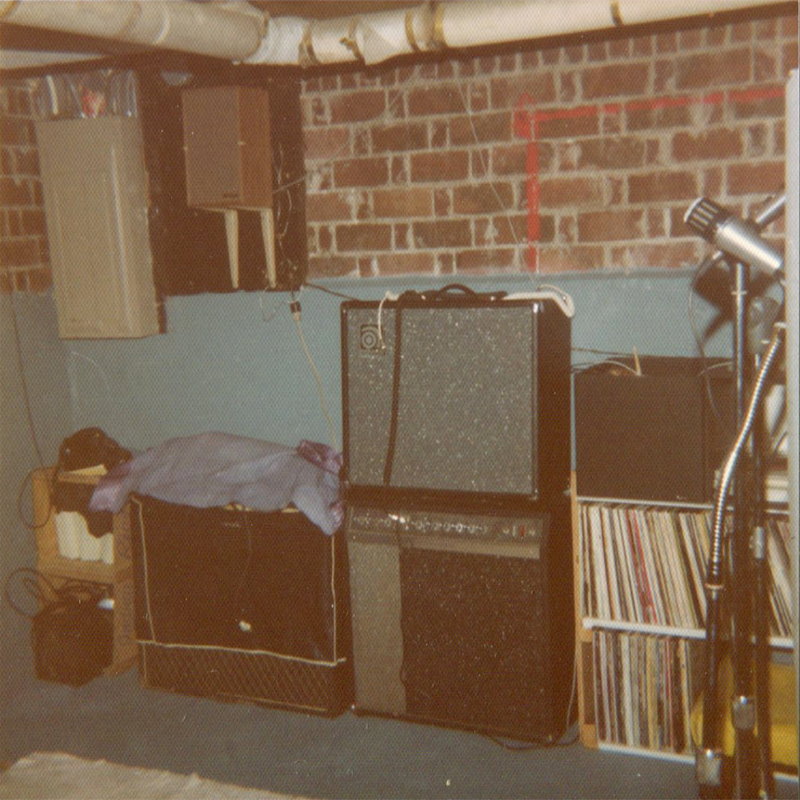 After visiting the second gallery installment, use the back arrow to assure the optimum Notes From a Basement experience. Text continues after gallery! 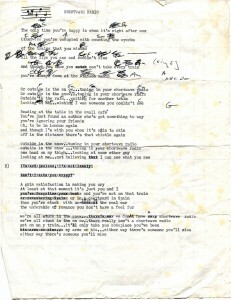 The rehearsal lyric sheet for “Shortwave Radio,” typed on my blue Smith-Corona portable. 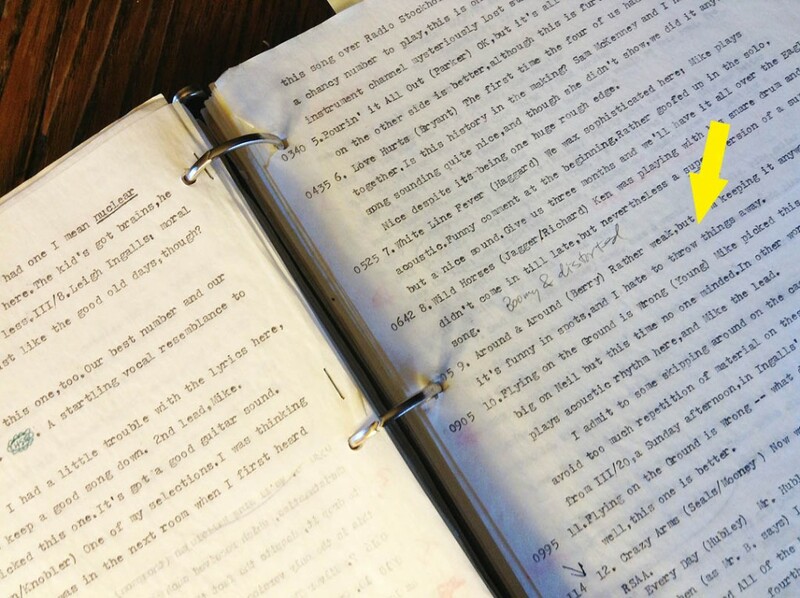 The yellow splotches on the paper are probably sweat or Freixenet sparkling wine, which I drank constantly during the golden summer of 1981. 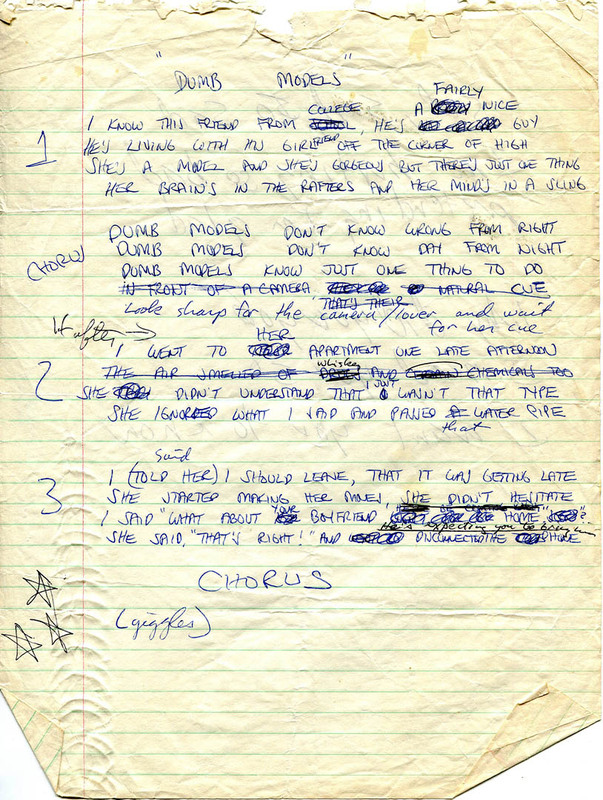 Song lyric sheets are quite evocative. They, more than any other category of the rubbish I hoard, often return me to the day. 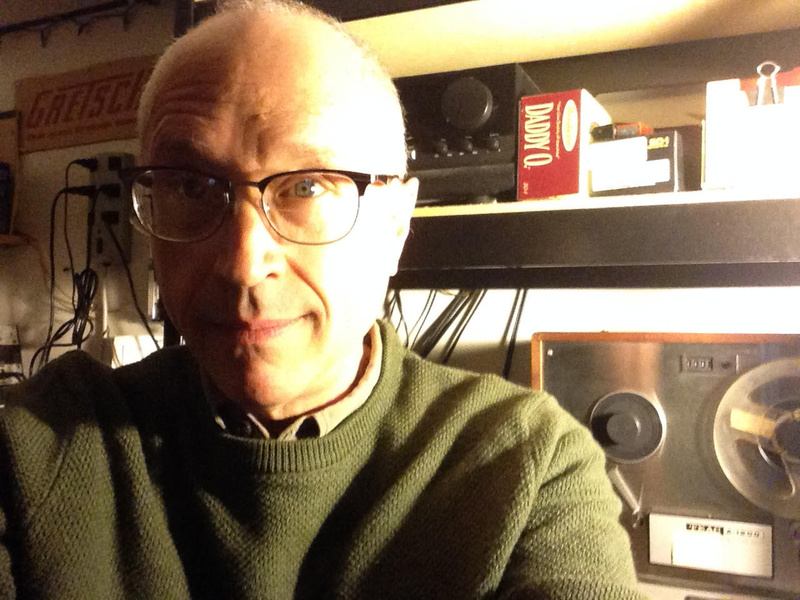 As I’ve previously written in this space, one of the clearer memories I have from the original Fashion Jungle days in 1981 is the writing of “Shortwave Radio” — sitting at the red table in my sister’s house on Cottage Road, drinking a gin gimlet, “Bob Newhart” rerun on TV with the sound off, etc. My process is to scribble down a bunch of crap until it coalesces into a song, and when it seems solid enough to start on the melody, I’ll type a clean copy. But the “Shortwave Radio” lyrics here give me a change to talk about secondary, but still alluring, aspect of documentation: incidentals. Nicholson Baker, an unusually focused writer whom I interviewed in 2000 following his purchase of the British Library’s hard-copy newspaper archives, first opened my eyes to the historical power of incidentals. He wrote (in The New Yorker, I think) about the computer databases replacing physical card catalogs in libraries. 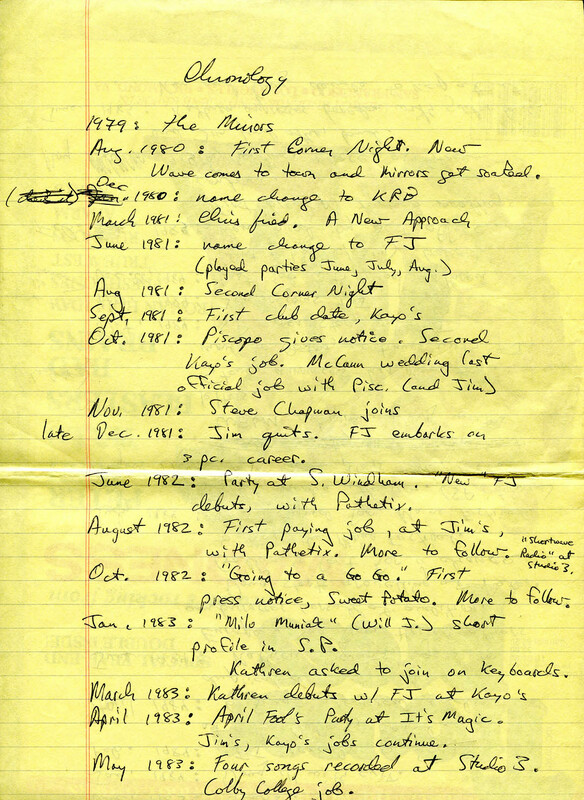 He didn’t like it; and one reason was that librarians tended to mark up catalog cards, and their markings constituted an important source of information that would be lost with computerization. That made perfect sense to me. Nothing happens in isolation, and the bits of stray information that come along with what you really intended to save can shed light on the context in which the primary event took place. 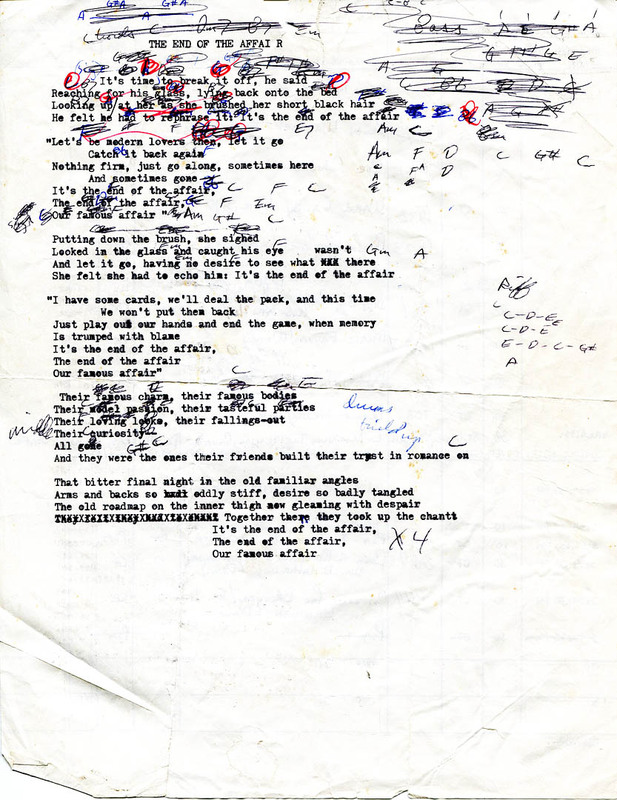 The backside of the “Shortwave Radio” lyrics — originally a WCSH-TV program log. 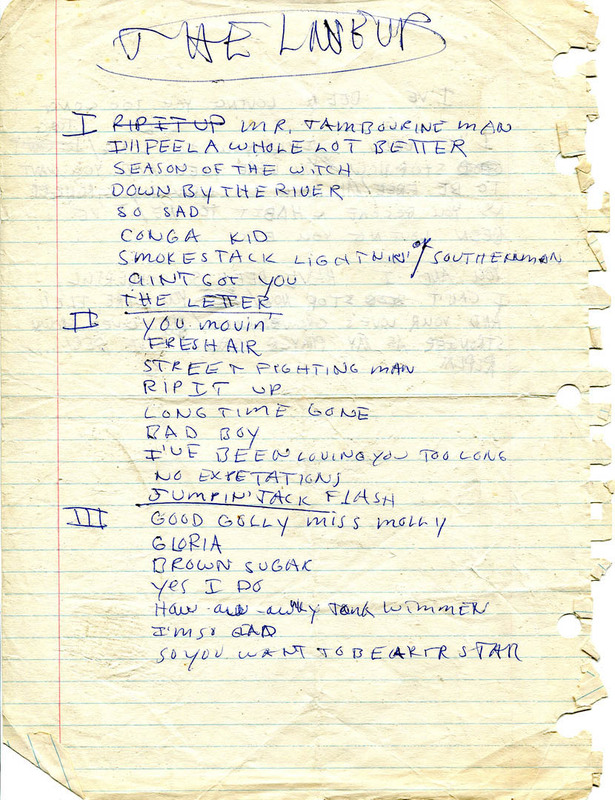 In this spirit, I’m presenting not only my original master copy of the “Shortwave” lyrics, but the backside of the paper I typed them on. It was originally the front: My father, Ben, worked in advertising sales at WCSH-TV, and being obsessively thrifty, would bring home discarded program logs (showing information about commercials) for use as scrap paper. 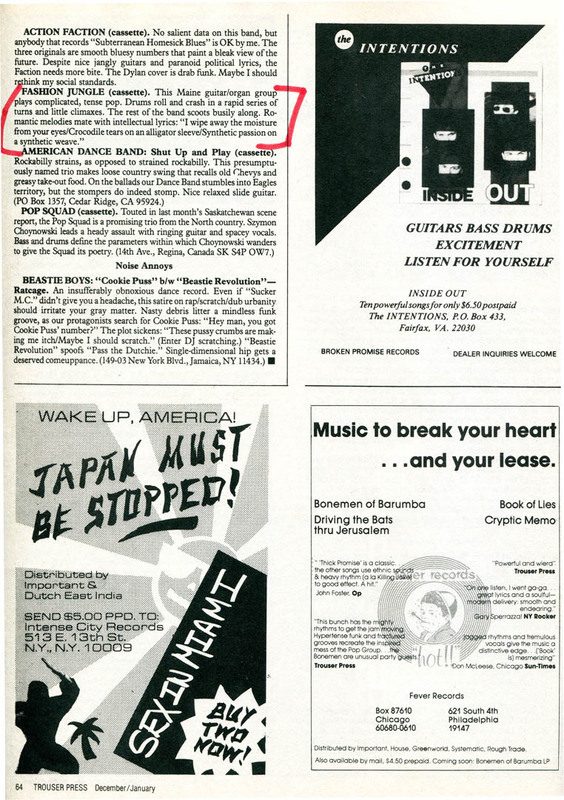 So, after you read the lyrics to “Shortwave Radio” and then go to my Nimbit Store to buy a copy (and then I would request that you burn it onto a CD and then copy it to an audiocassette, all while thinking of me), take a look at the entries on the program log. When was the last time you saw a TV ad for Canada Dry mixers or Quaker State motor oil? 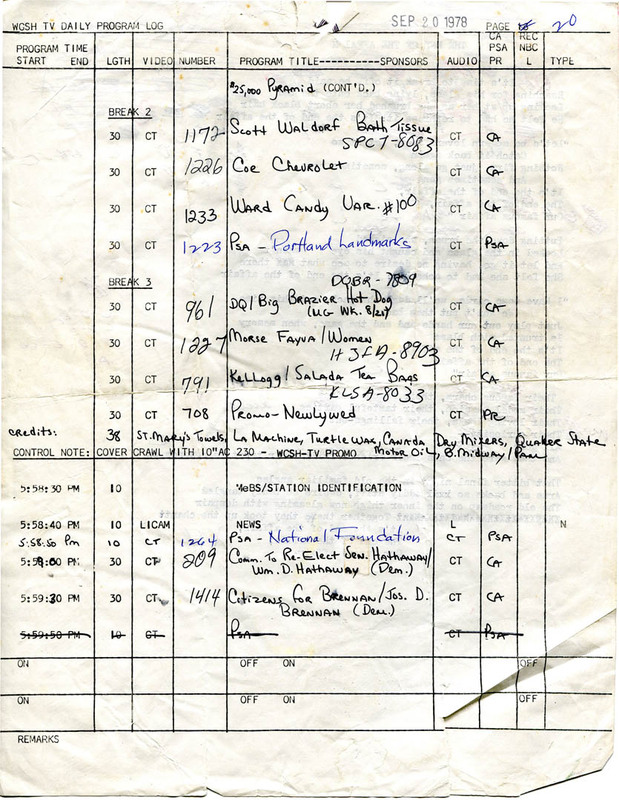 And note the political spots at the bottom of the sheet. See more original Fashion Jungle images. Text continues after gallery! It strains me to have to accept that my legendary memory ain’t what it used to be. Time is hollowing out the past as it exists in my mind. It shakes me up to have to acknowledge this. 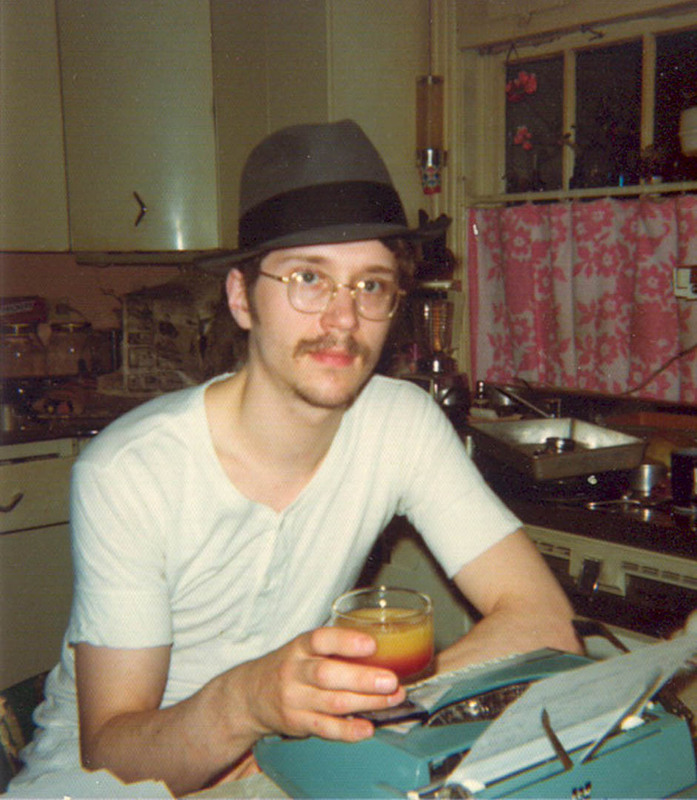 Writing a play, or playing at writing, complete with tequila sunrise, in 1975. Hubley Family photo. But acknowledge it I must. I know people much older than me who share my belief (or more likely gave it to me) in the evocative power of documentation, and I’ve seen how the memories continue to evaporate while the goddamned paperwork just keeps piling up like the snowdrifts in the pre-climate-change winters that we don’t have anymore. Paper covers rock, but it doesn’t stand a chance against time. And neither do the rocks. The saddest or silliest thing about all this musing about documents and memories, about the paper trail that leads to an outline of a version of a possible life, out of all the possible lives, is that for all these years I have entertained the notion that all these documents would someday be of historical interest — that I should keep them because some institution would someday want them for the sake of researchers who would want to know more about me. This on the basis of a small writing career largely given over to the exercise of marketing communications; and a tiny musical career. It embarrasses me to confess this, but I do so in the hope that it may (a) be of some kind of interest — delusions being both entertaining and informative — and (b), more selfishly, that it might help me get over the idea. I’ve come to realize that if anyone’s going to write about me, it’s probably going to be me. And I’m already doing it. And thank you for continuing to read it. As long as we’re rummaging around in the archives, here are four more recordings for your pleasure and bemusement. Why This Passion (Hubley) An early version of a romantic song debuted by the FJ in 1984. In later years, this cumbersome setting was discarded for a more straightforward and rocking arrangement. 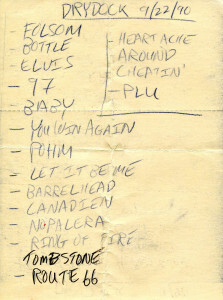 Recorded at Geno’s, Oct. 12, 1984. 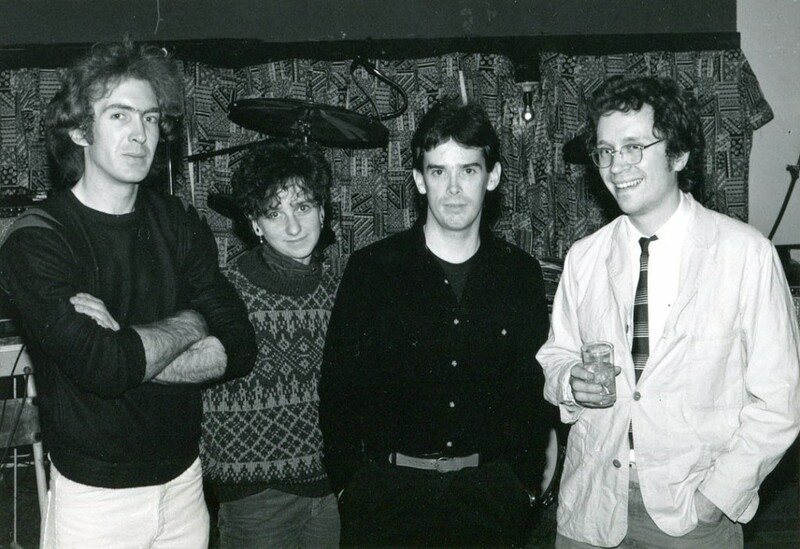 Corner Night (Demo 1985) (Hubley) Elvis Costello much? Ray Davies much? Self-referential much? I wax reminiscent about the early days of the Fashion Jungle in this song written and demoed in 1985 for the Dan Knight edition of the FJ. 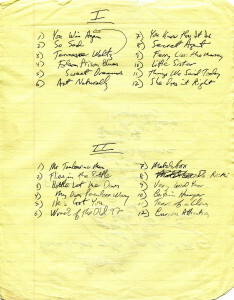 These four songs copyright © 2010 by Douglas L. Hubley. All rights reserved. 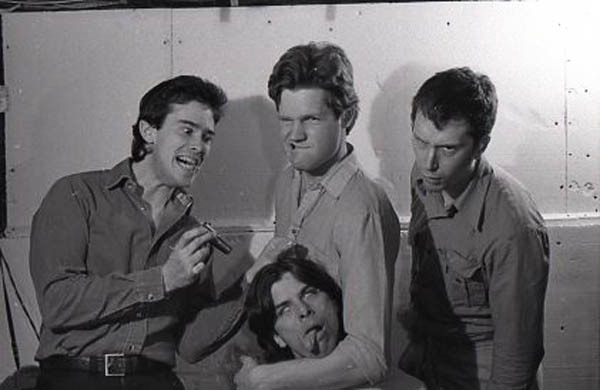 See images from the times before and between bands. 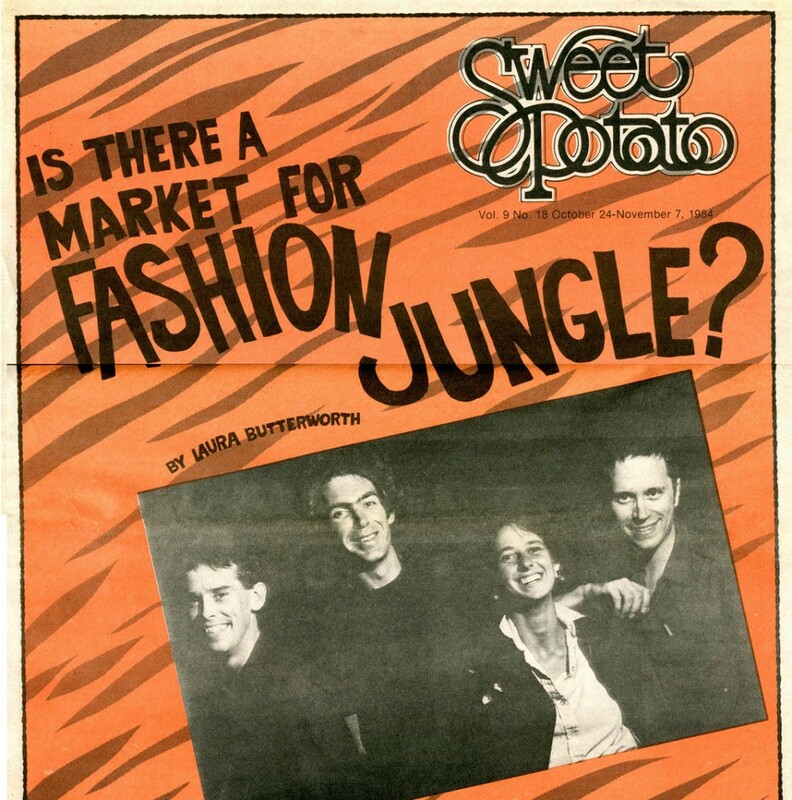 The Fashion Jungle on the cover of the Rolling Stone — er, Sweet Potato. Click to enlarge. Photo: Rhonda Farnham Photography. No text! Go straight to music! I never quite understood Laura’s remark about me and the biology lab. Did I look like a scientist, or a science project? And that wasn’t my only beef with her Sweet Potato cover story about the Fashion Jungle. 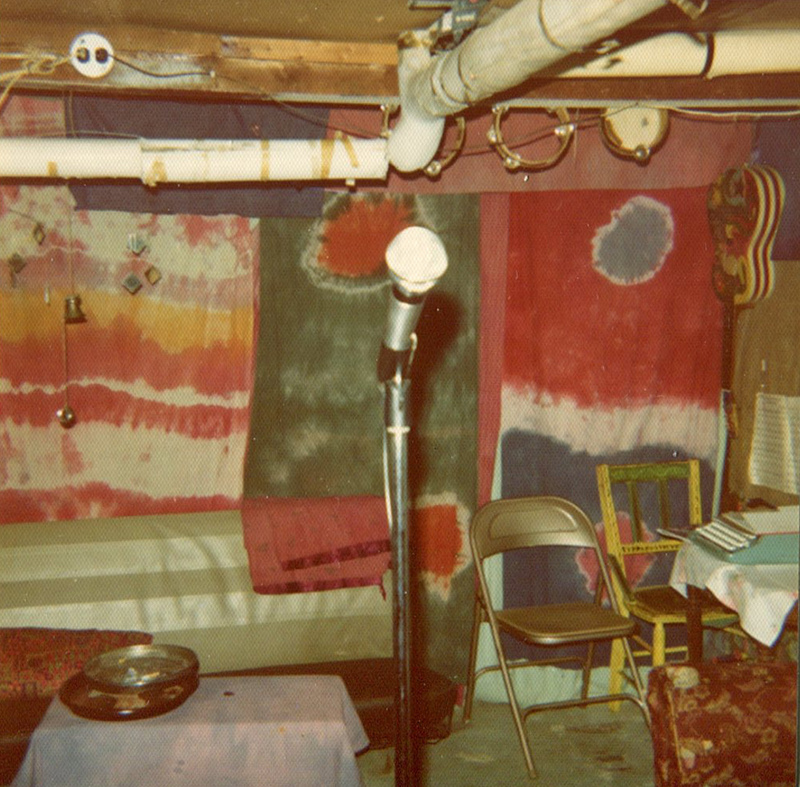 The story’s opening is confusing, as she brings the reader from an FJ performance at Geno’s in the first paragraph to an FJ rehearsal in my parents’ basement, in the second, without ever announcing the shift in setting. Was Baked Fresh Daily playing at my parents’ house? I don’t think so! 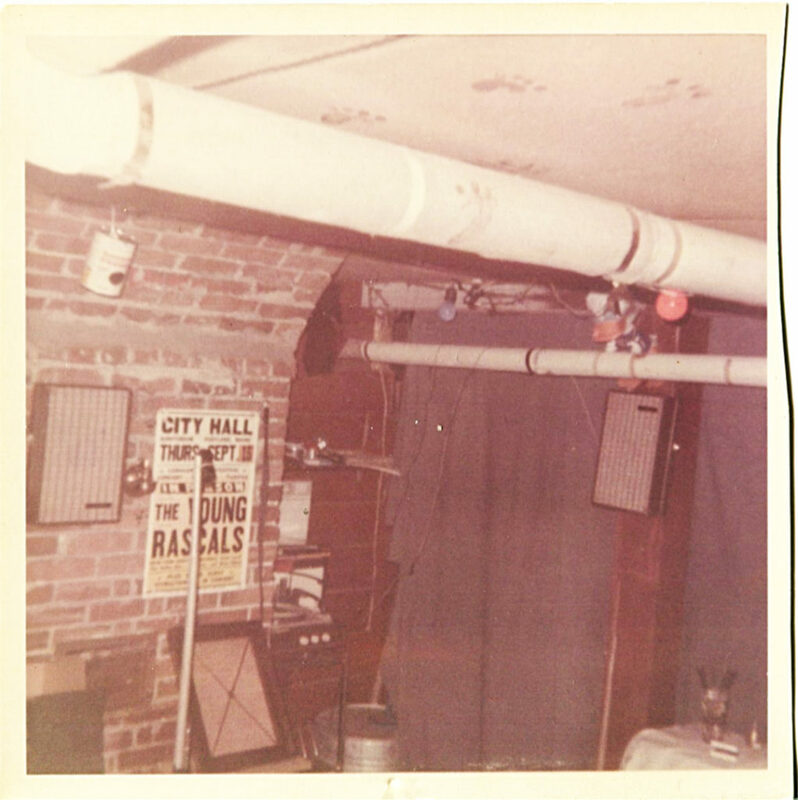 And things happened in the restrooms at Geno’s location on Brown Street that never happened in my parents’ bathroom. 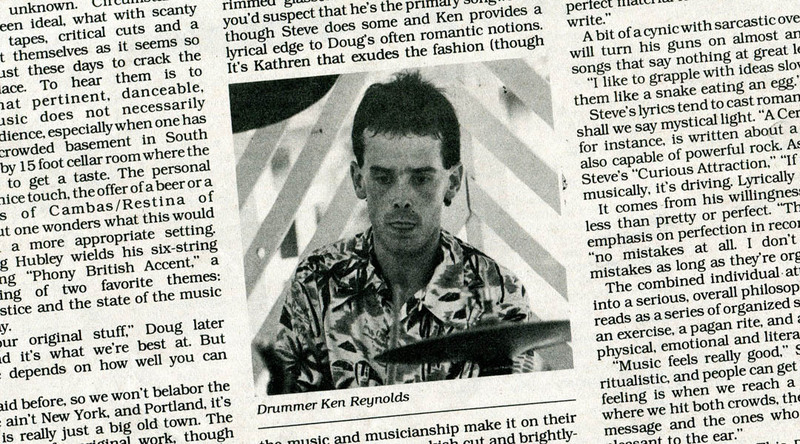 Ken Reynolds, “the band’s anchor behind the drumkit,” with the Fashion Jungle at the Maine Festival, August 1984. Click to enlarge. Image from Sweet Potato Magazine, courtesy of Rhonda Farnham Photography. Butterworth also credits me with the lyrics to “Entertainer,” when in fact it was drummer Ken Reynolds who did the field research at the Stardust, a now-departed burlesque club on Congress Street, and then penned the musical query about a stripper’s state of mind. 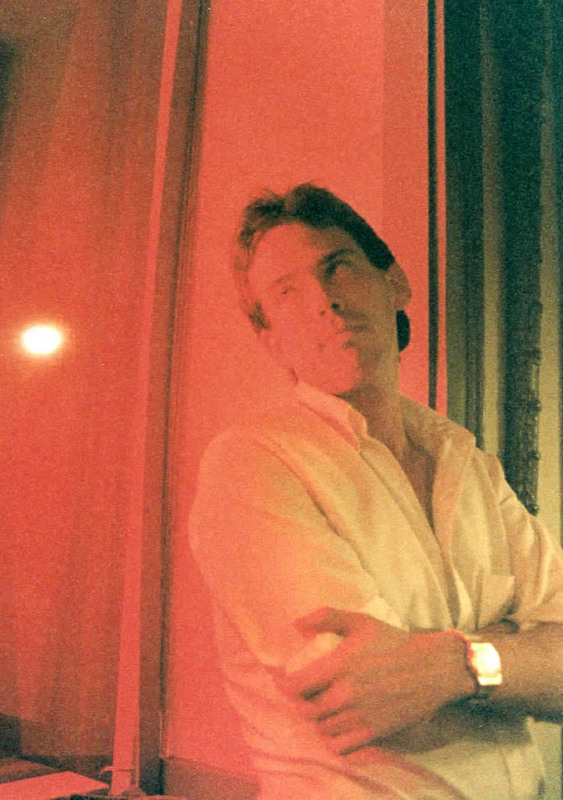 Now a real estate agent and small-plane pilot who occasionally combines those skills, Butterworth was an impressionistic writer whose journalistic interests lay more in the fashion industry than in music. 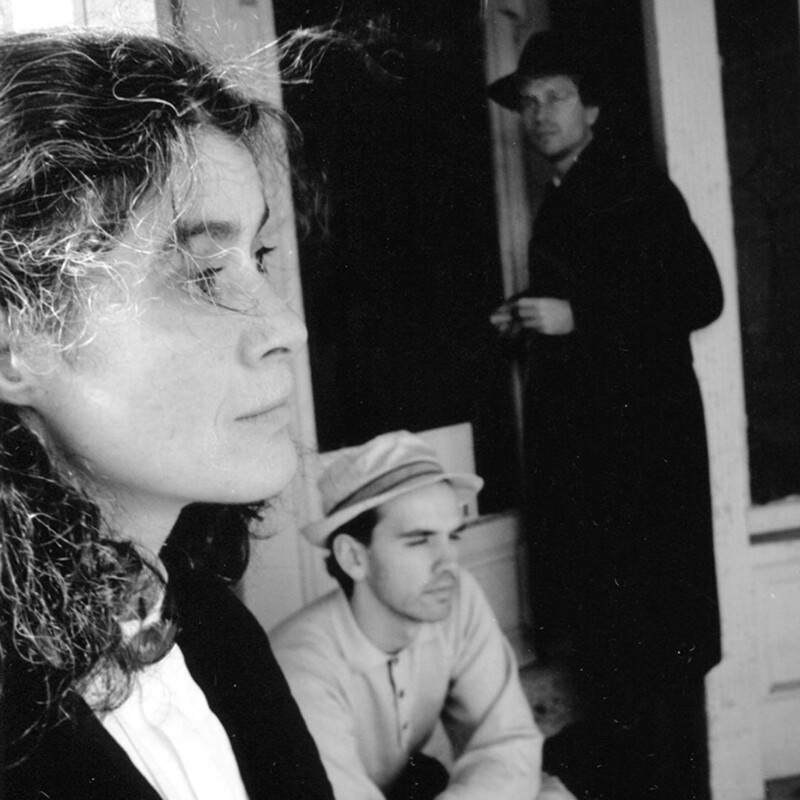 But the biggest problem with her article ― which, in truth, was very sympathetic to the band (and highly accurate when she credited us with “one of the finest arrays of original material that Maine has to offer”) ― was its timing. The FJ she portrayed was a band unhappy about its lack of commercial prospects, but still solid, forward-looking and fighting the good fight. 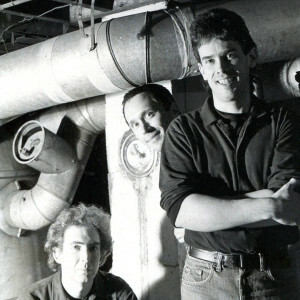 That was the impression she got in August 1984, when she interviewed us and attended the rehearsal in South Portland. 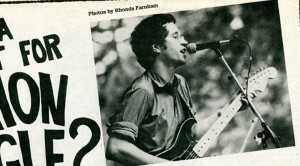 But needs and interests inimical to the band’s solidarity were in play even then. And by the time her article hit the newsstands, in late October 1984, nearly 28 years ago, the Steve Chapman–Kathren Torraca FJ was on the skids. I must say, I’ve given a lot of thought to this particular post. It could easily become the mirror image of my chapter about the breakup of the original Fashion Jungle, which anticipated the Chapman-Torraca demise by three years, to the very month. The particulars were different, but not the underlying forces: the pressure to find meaningful or at least lucrative day jobs; the sense that Portland wasn’t the place to find them; and the youth-driven imperative to get the hell out of here (an imperative that I’ve felt, but only long past the end of youth and way too late to do much about it). Escapee from a biology lab? How’s that again? Click to enlarge. Image from Sweet Potato Magazine, courtesy of Rhonda Farnham Photography. Also the same, only elevated to a higher order of outrage because the band was sounding so good — and because, goddamn it, we’d been through this once already before — was my response: Why, oh why, did the band have to come apart just as things were starting to happen? I was furious then. I can still feel it. In my selfish view, it was just such a waste. It was too soon for it to be over. I mean, look at it: We could play at Geno’s as often as we liked; in August, we performed at the prestigious Maine Festival, in Brunswick*; we had a recording on the market; we were getting media recognition from not only the local music paper, but the region’s two hip-and-cool radio stations, WBLM-FM and WMPG-FM. Surely there was more and better ahead. And those were just the trappings of success. Most important, as the Geno’s recordings that accompany this post demonstrate, we were simply playing great — though it’s also true that for all of 1984, I was the only active songwriter in the band, and I was anything but prolific. 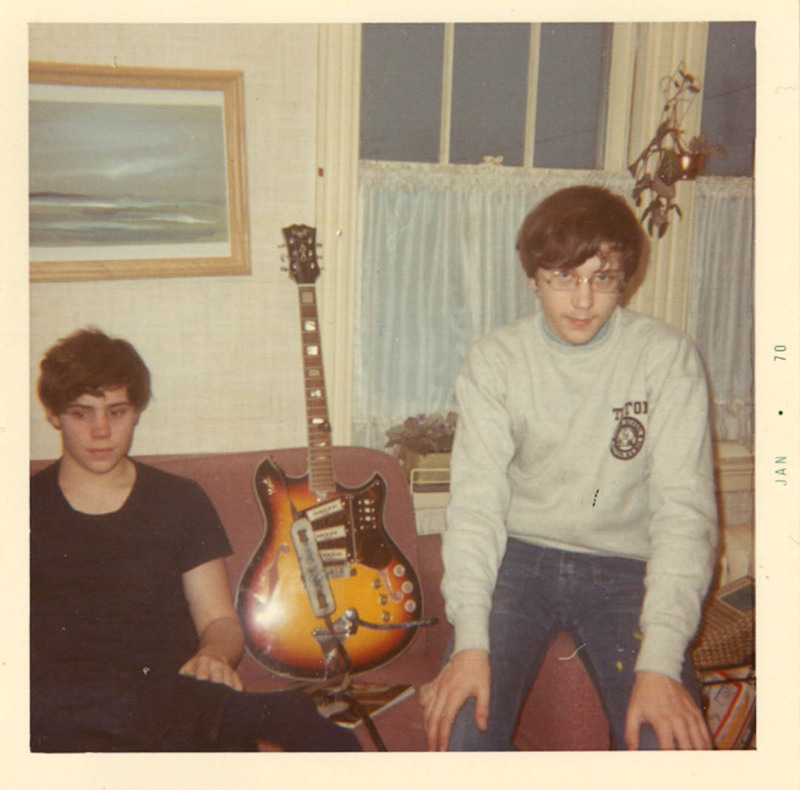 When Steve announced, at a late-summer party at Ken’s apartment, that he was moving to Boston to study computer science, I was upset but not surprised. The handwriting had been on the wall. The charms of cooking soup at a pub-grub eatery in Portland are not infinite. And Steve was in love with a woman from Boston. 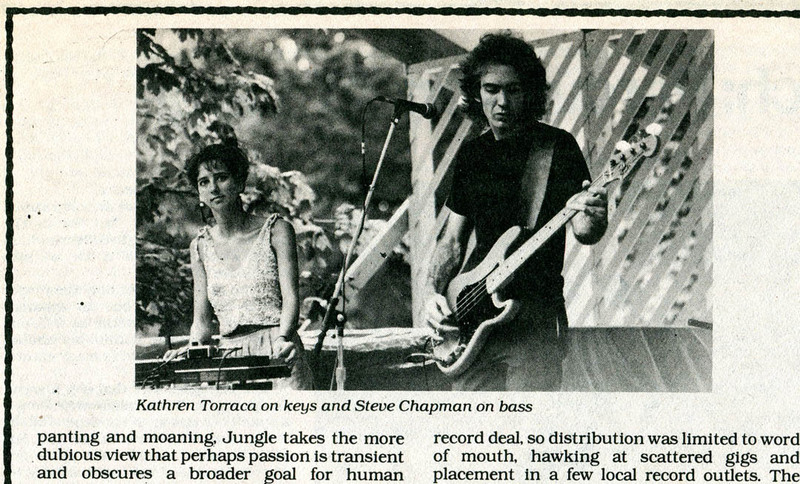 Keyboardist Kathren Torraca, at left, and bassist Steve Chapman with the Fashion Jungle at the Maine Festival, August 1984. Click to enlarge. Image from Sweet Potato Magazine, courtesy of Rhonda Farnham Photography. Kathren was also restless, sick of her job, ready for higher education and a change of scene; we had been accepted at the Maine Festival while she was off on a European getaway, an absence that had made me wonder if we’d be able to do the festival at all. And Ken was out of school and working part-time at the post office ― evenings. So much for the rehearsal schedule. And the switch to night work strained him physically and emotionally. 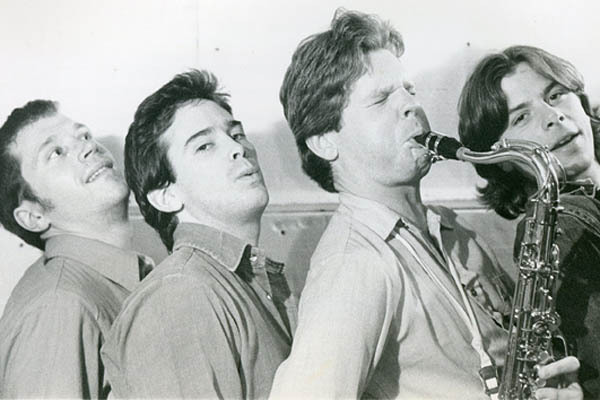 So in the autumn of 1984, there we were on the cover of Portland’s only music newspaper, smiling brightly, ready for fame if only it would come knocking. 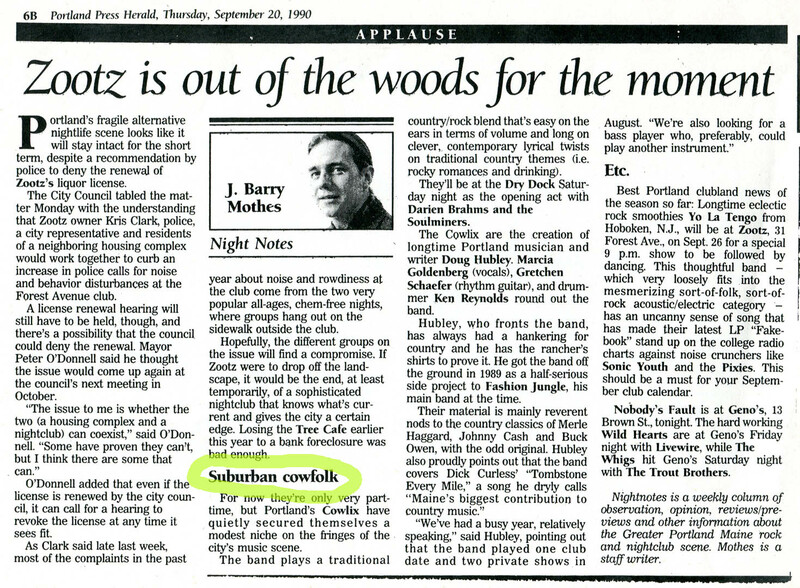 And there we were, not on newsprint but in reality, reduced to once-a-week rehearsals at Ben and Hattie’s, no new material coming in (we even tried Petula Clark’s “Downtown”; I still have Kathren’s “hits of the ‘60s” songbook), the old stuff getting more and more leaden, everyone looking in different directions. 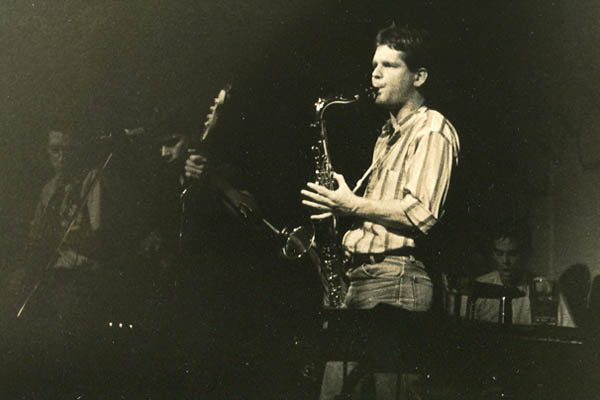 Jim Sullivan rejoined the band, playing mostly sax and commuting from Boston with Steve. Steve switched to a fretless bass. 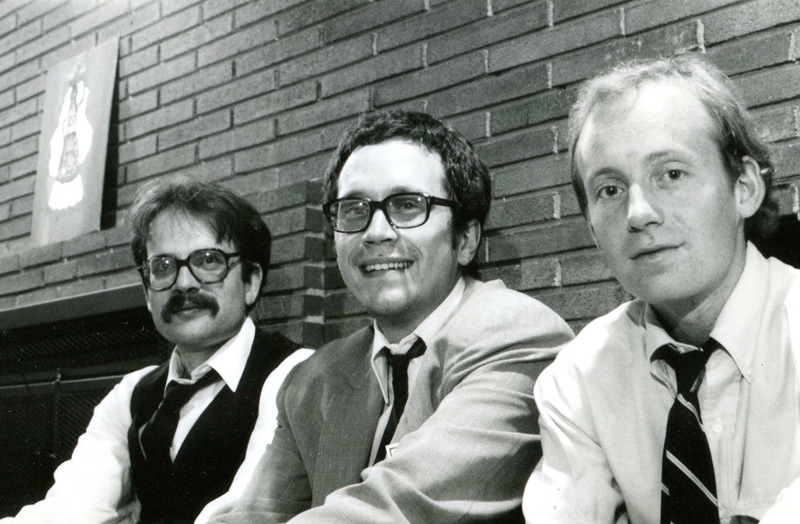 Each of those developments came with a learning curve that, by that point, just seemed insurmountable, though it was nice to work with Jim again. 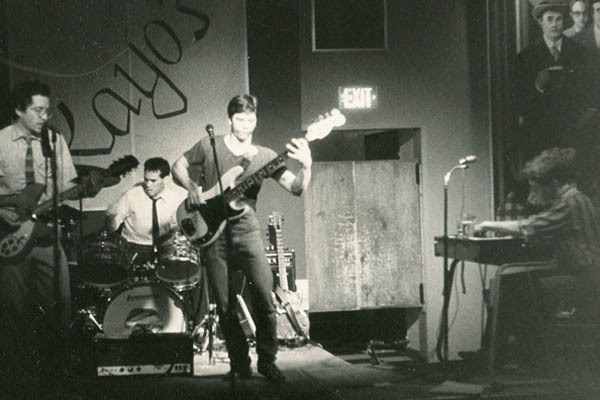 The four-piece band played Geno’s on Oct. 12 in a performance that I’ve spent 28 years thinking was our last; hear recordings from that gig at the links below. And just yesterday I rediscovered in my notes that the five-piece band had a Geno’s date on Dec. 28. I have no recollection of it, to say nothing of a recording. And that was that, really. 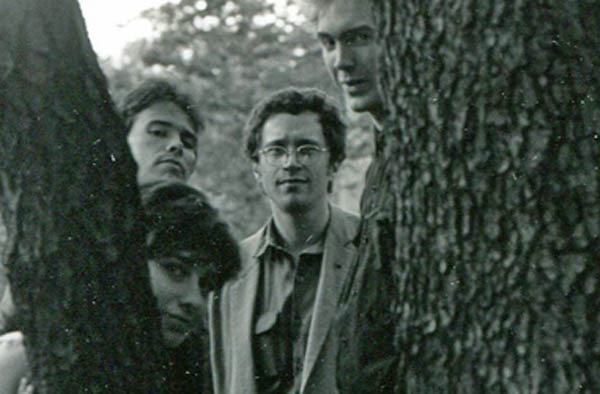 Through the first five months of 1985 we continued to get together while taking turns declaring the end of the FJ: me because I was tired of the uncertainty, Kathren because she wanted to try different types of music, Steve because it was too difficult making it work from Boston — and he and Jim had gotten into a band down there, anyway; and Ken because the P.O. had hired him full time, evenings. But the particulars don’t matter. Endings declare themselves. 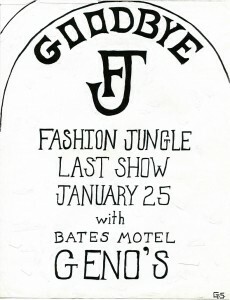 The Fashion Jungle at Geno’s, 1984. 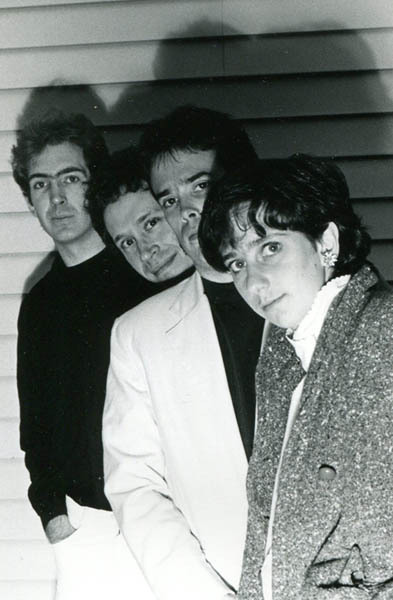 From left: bassist Steve Chapman, keyboardist Kathren Torraca, drummer Ken Reynolds, guitarist Doug Hubley. Photograph by Jeff Stanton. 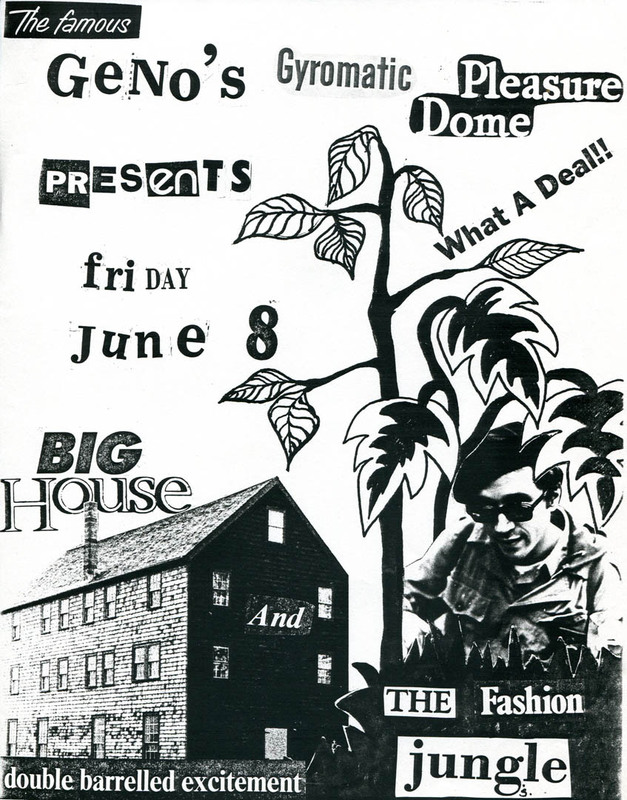 Geno’s, Portland’s answer to the punk dive bar that every self-respecting city must have, is looking at its 30th anniversary in 2013, and merits its own post in this series. 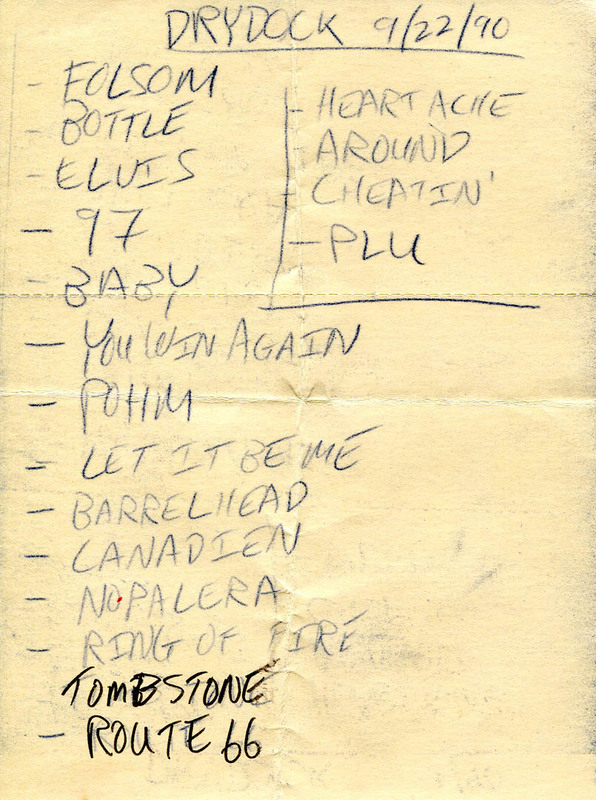 For now, though, all I can offer is this selection of seven songs from a performance, late in the life of the 1983-84 Fashion Jungle, recorded at Geno’s original location on Oct. 12, 1984. Rather distorted, hence the bargain-basement price point on the Nimbit store. 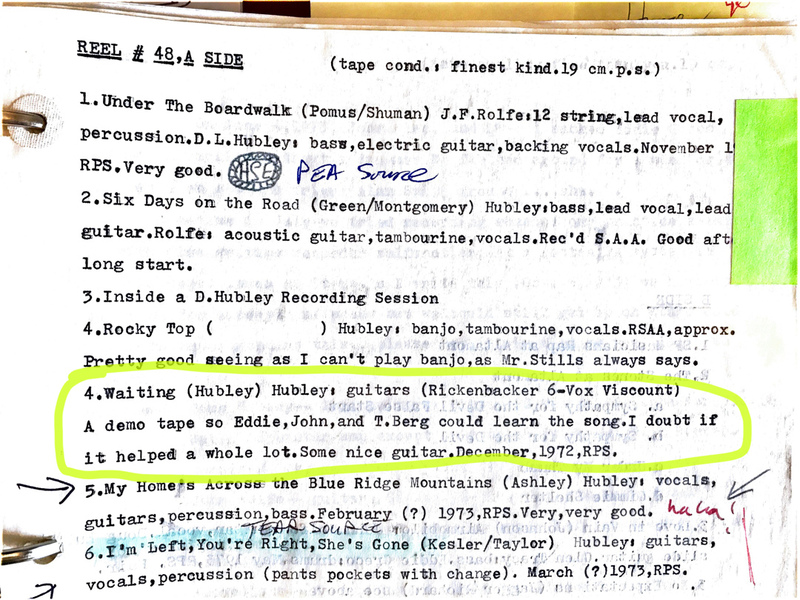 Recorded with two mics on a two-channel consumer-grade cassette deck ― it’s analog tape, kids! Pleasures of the Flesh (Reynolds-Hubley) Ken sings his lyric about a “friends with benefits” arrangement that ultimately rings hollow. Hot stuff, especially in the solos. Old Masters (Chapman) Steve’s commentary about the relationship between technology, culture and fine arts was the first song with lyrics that he contributed to the FJ. Coke Street (Hubley) In the 1980s, Portland’s Old Port Exchange was the go-go ’80s writ large and ornamented with seagulls. This country song with its odd lopsided rhythm was one of my rare attempts at social commentary, and one of my two compositions from 1984. Nothing to Say (Hubley) Art imitates life for five minutes. 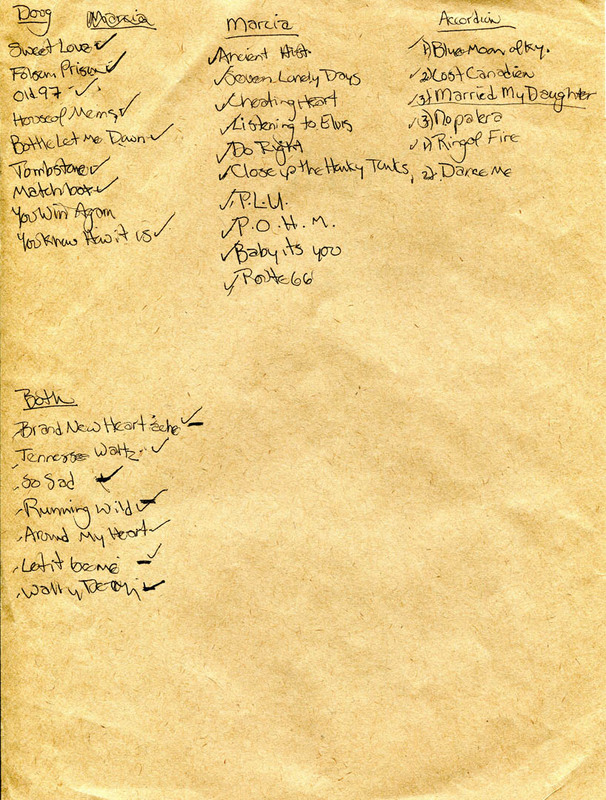 Compare with the Six Songs version. 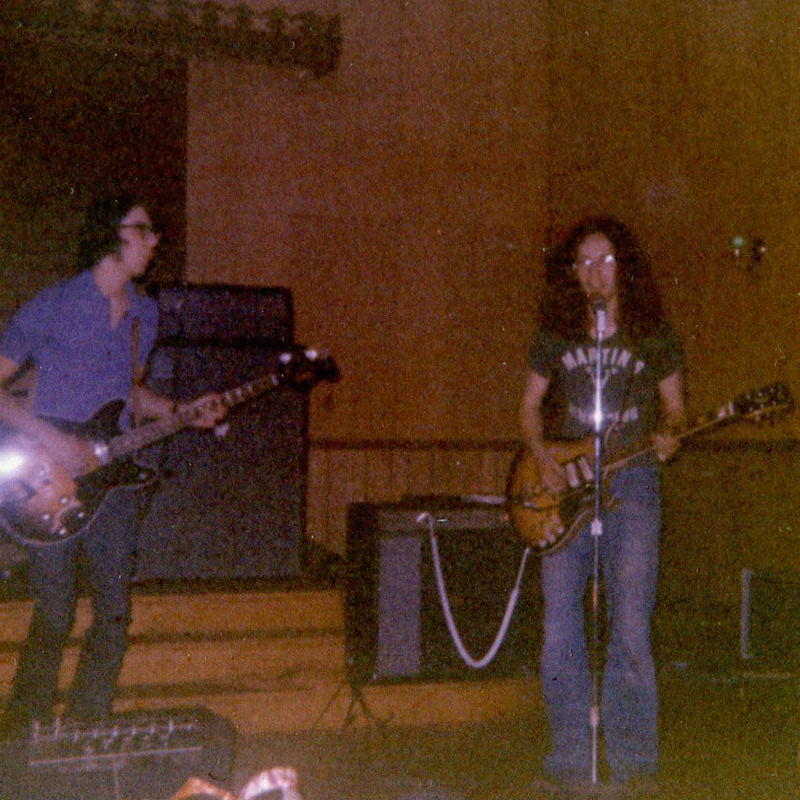 The guitar is the Rickenbacker 12-string. End of the Affair (Hubley) Always a passionate number, this was particularly poignant for me during this show, which I figured was pretty much the end of the FJ. Keep on Smiling (Hubley) A little too impassioned, maybe! “Pleasures of the Flesh” copyright © 1984 by Kenneth W. Reynolds and Douglas L. Hubley. “Old Masters” copyright © 1982 by Steven Chapman. “Coke Street” © 2012 by Douglas L. Hubley. “End of the Affair” and “Nothing to Say” copyright © 1984 by Douglas L. Hubley. “Keep on Smiling” © 2010 by Douglas L. Hubley. All rights reserved. 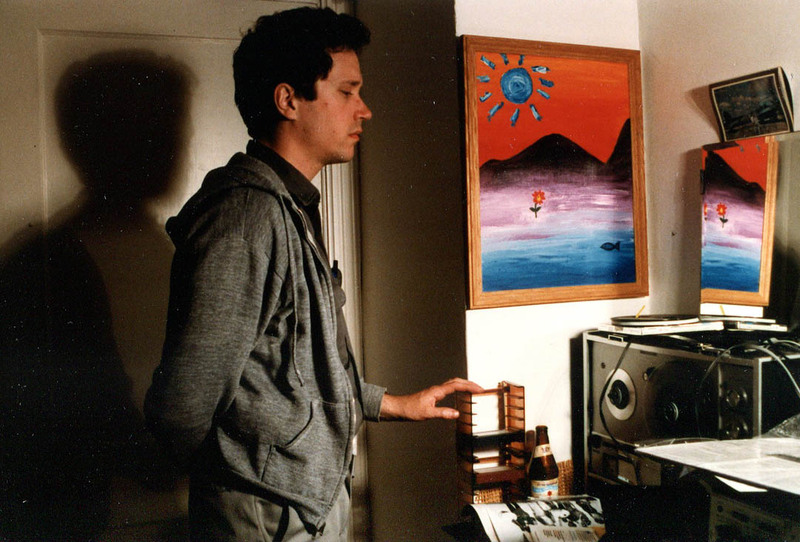 *I hope someday to present on this site Jeff Stanton’s film of that technically troubled but musically compelling performance.